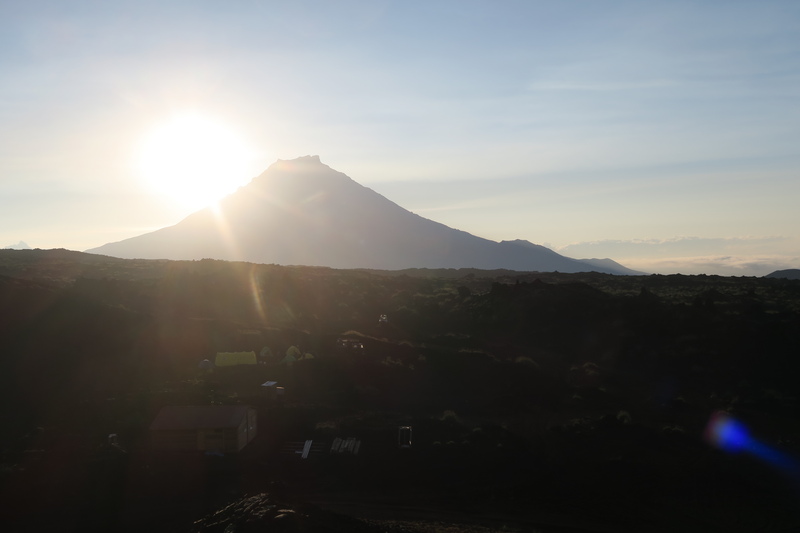 At sunrise we find a large pile fresh dung, only 5m from our tents. While we pack, we keep an eye out. 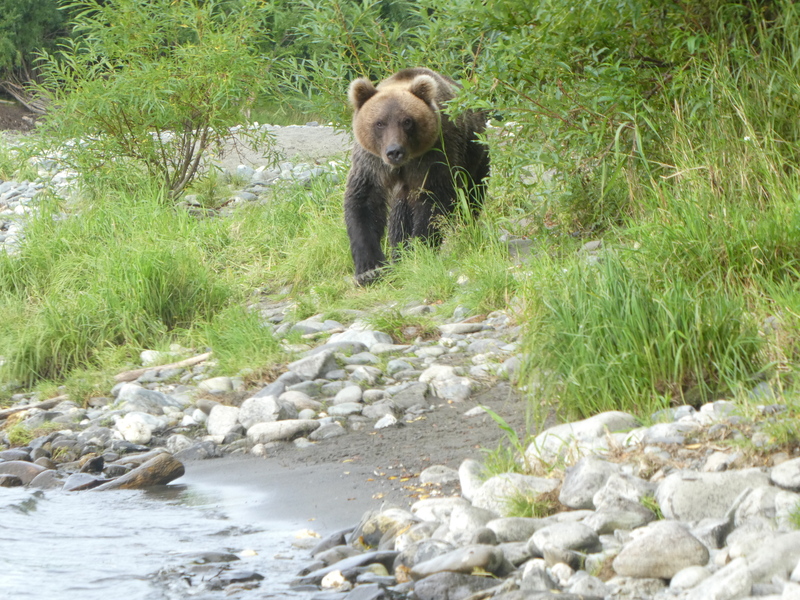 Then we see it; a Kamchatka brown bear on the opposite river bank. 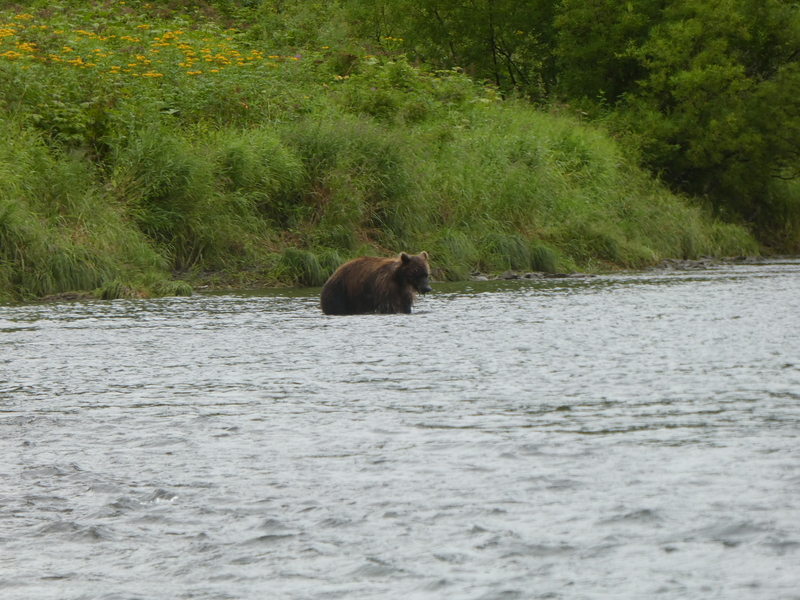 The bear starts to fish, at the spot where we caught two trouts last night. 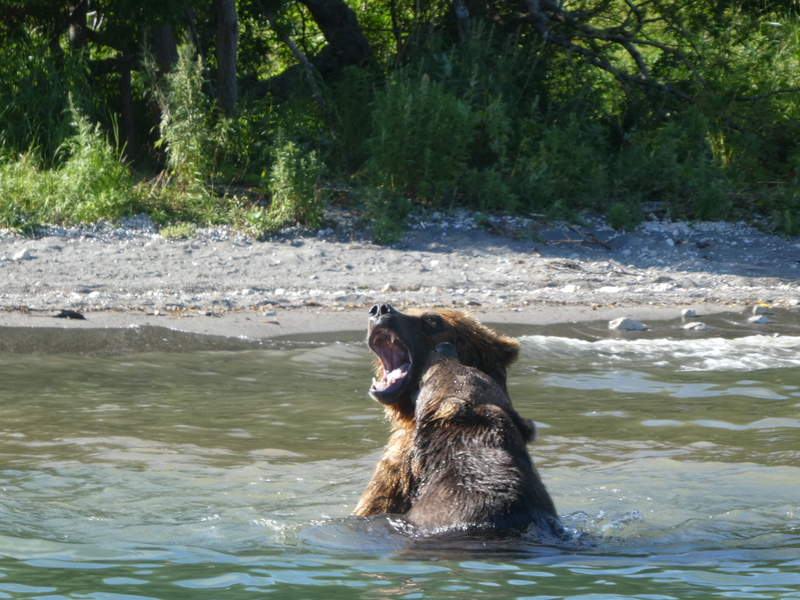 As if we are not there, the bear crosses to our camp’s shore. 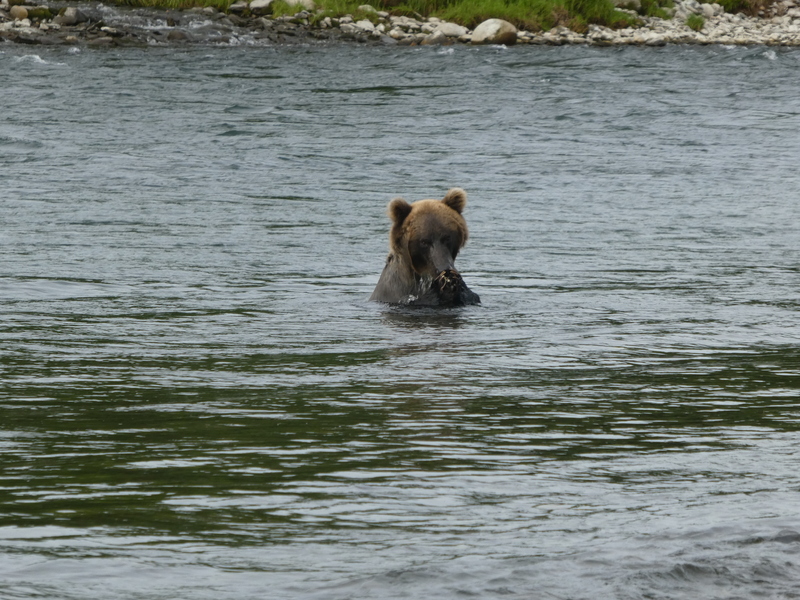 As we enter our rafts, the curious bear is less the 5 meters from our camp. 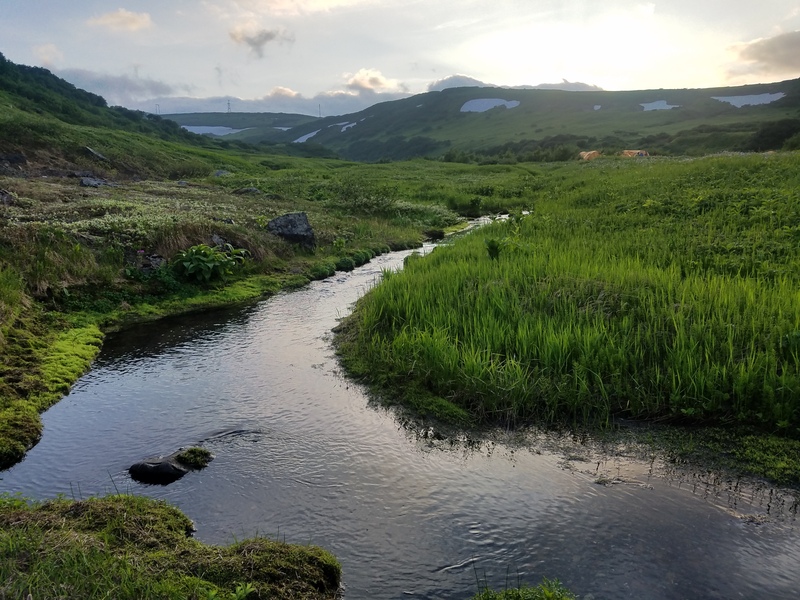 For 12 days, we traveled one of the most remote, inhabited regions of the world: Kamchatka. 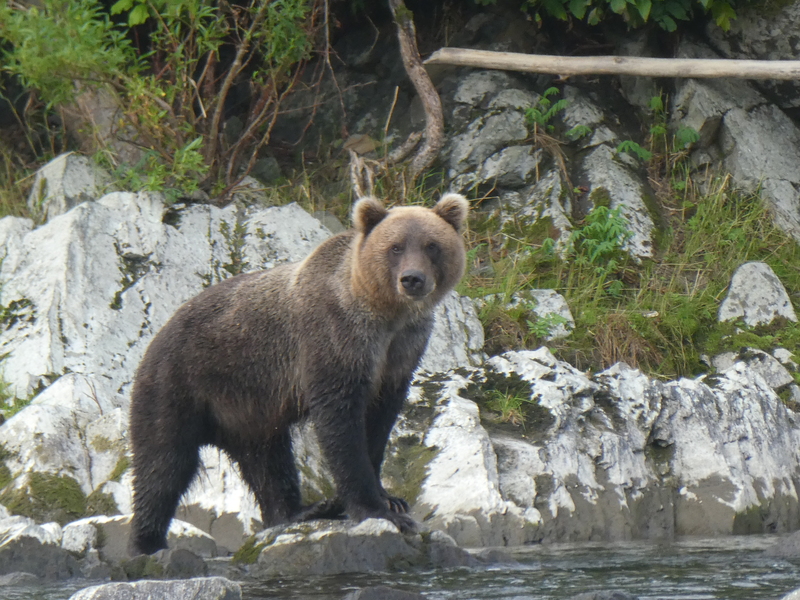 We have climbed volcanoes at Tolbachik and Mutnowski, rafted the Bystrya River and watched the bears at Kuril Lake. 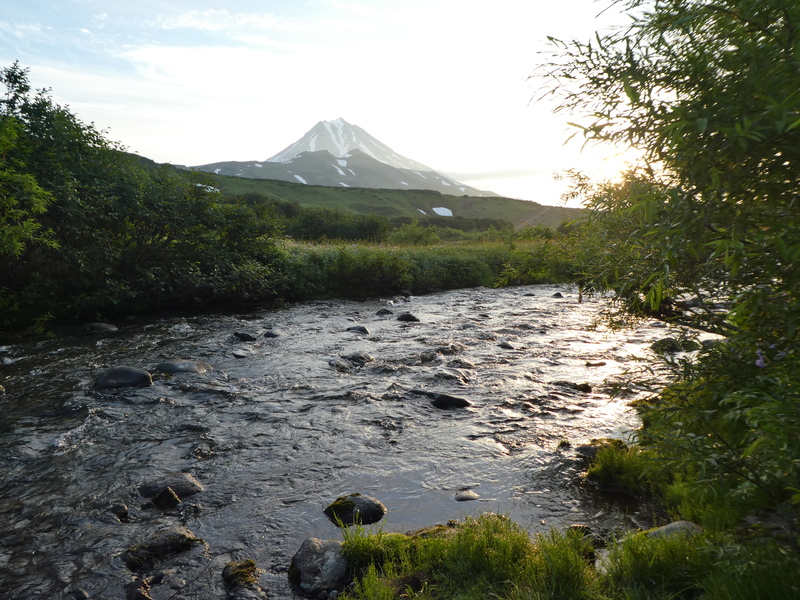 We have booked the Classic Kamchatka Tour with Vision of Kamchatka. 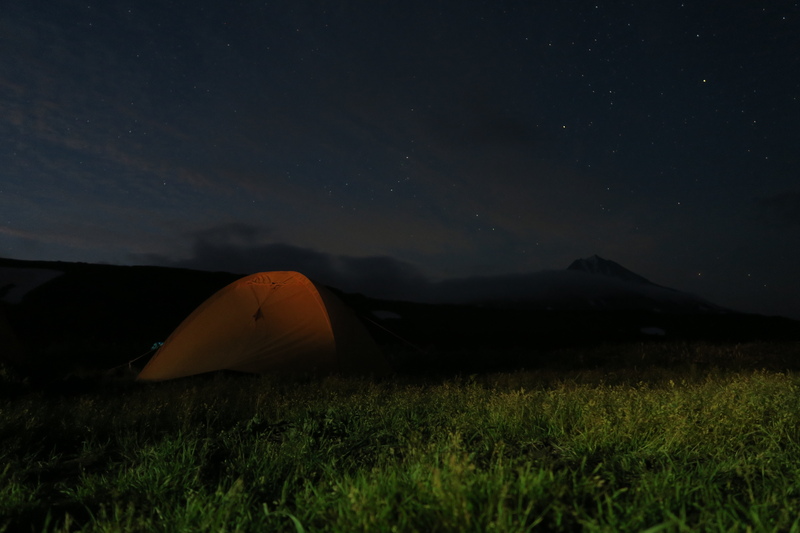 Spend a night at Kuril Lake. 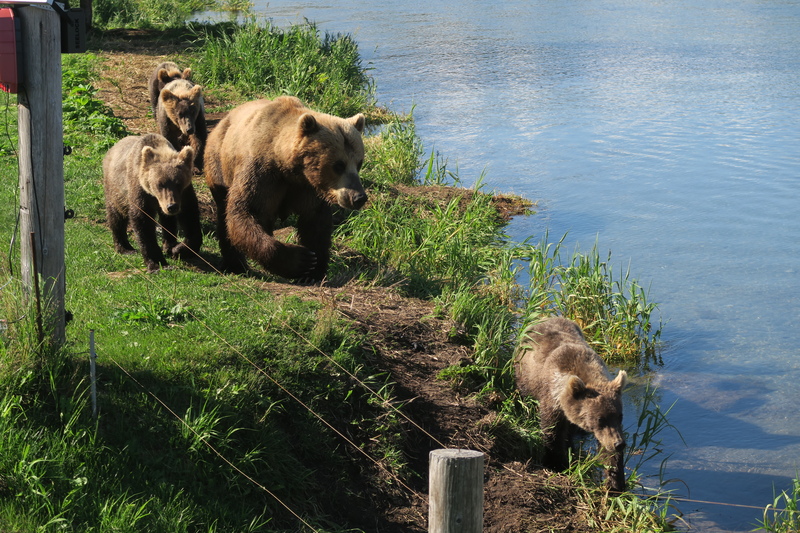 The helicopter day trip was very short (just 1.5h at Kuril Lake), giving us a bit of a zoo visit feeling. Travel more individually. However, while individual travel, e.g. hiking would be beautiful, there are two major difficulties (a) logistics and (b) bears. We check into the Skyport Hotel, directly at the airport and catch a few hours of sleep. 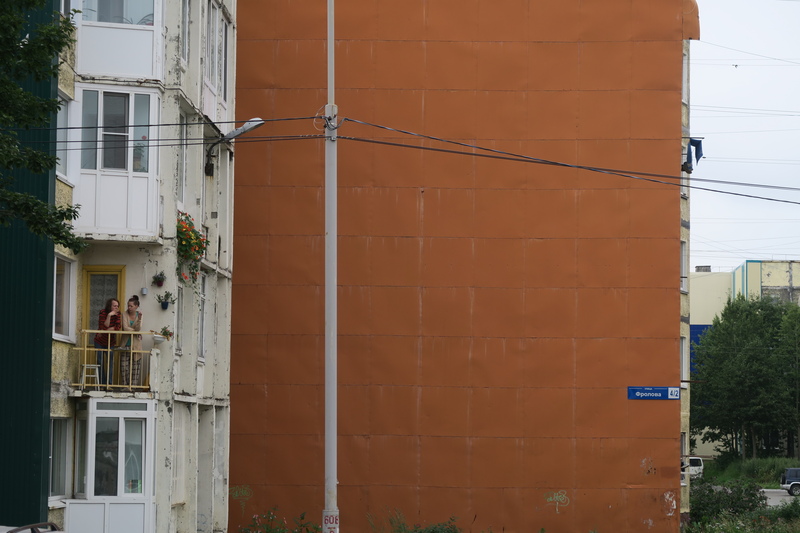 At 12, we meet Olga for a tour of Novosibirsk. 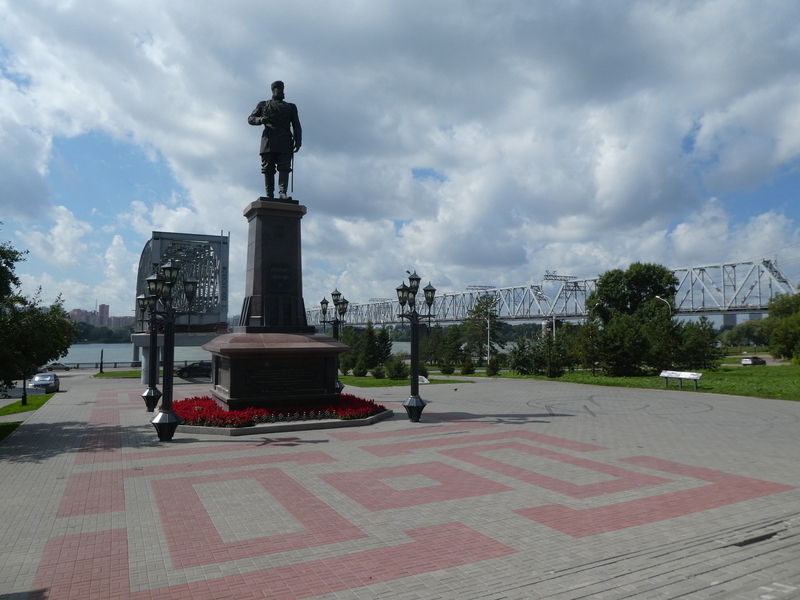 We see the monument of the Transsibirian Railway, which is a segment of the original bridge from the 1890s and a statue of Zar Alexander 3rd, who commissioned the bridge. 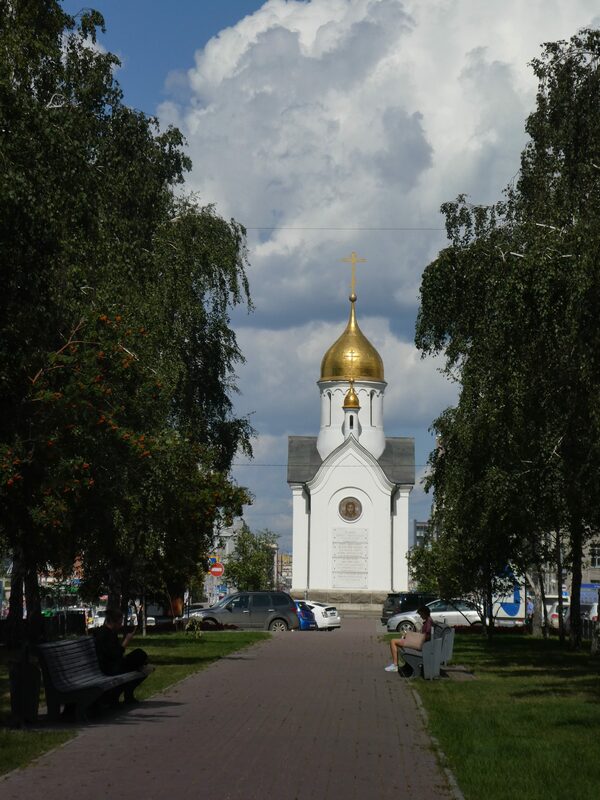 Next, we stop at the Roman Orthodox Cathedral and walk up Krasny Avenue (main street), past the German Consulate to a little chapel, which used to symbolize the center of the Russian Empire from East to West. 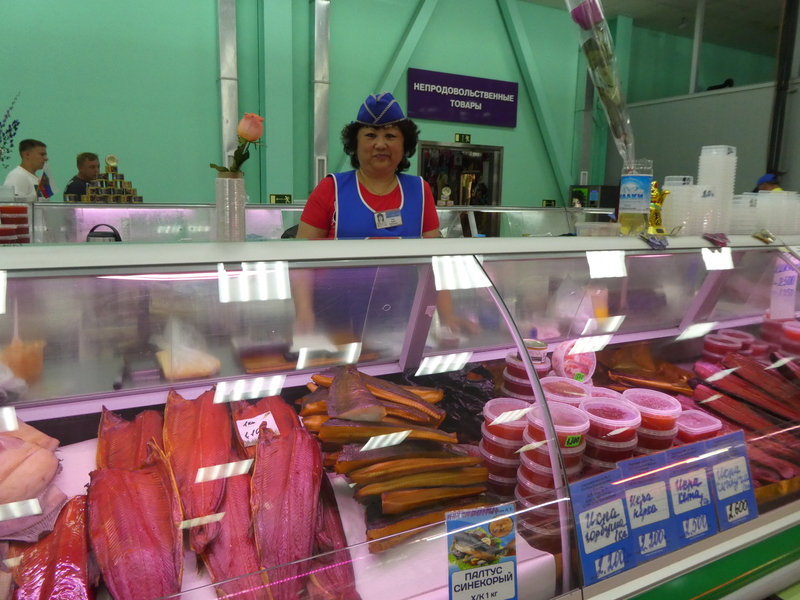 After a walk through town, we have lunch on Lenin Street; Herring Salad and Pelmini. 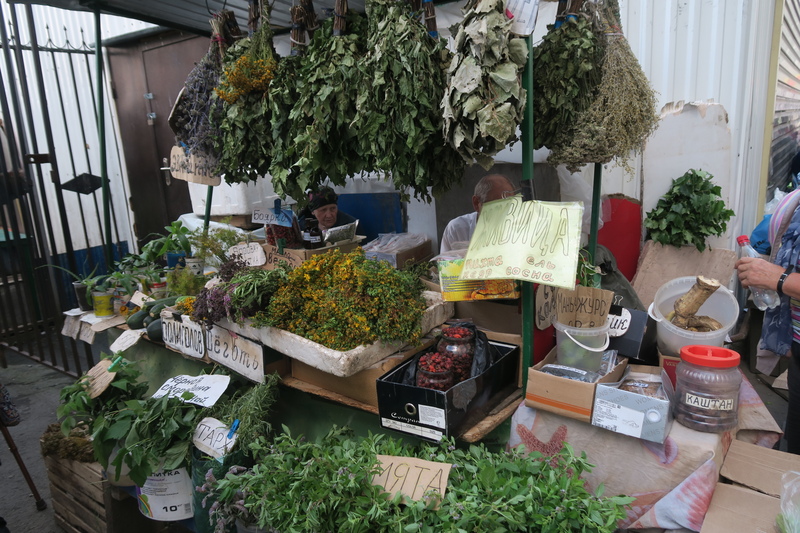 After lunch, we visit the market and stop by the train station with its impressive waiting hall and the local market, before going back to our hotel. Another hour of sleep, then we are on our way to the airport. Flight is delayed again. Finally, we board at 0.45 and take off one hour later. It was well worth the investment of 115EUR (8.000Rub) to upgrade to business class. We arrive at 12.30 local time (utc+12). 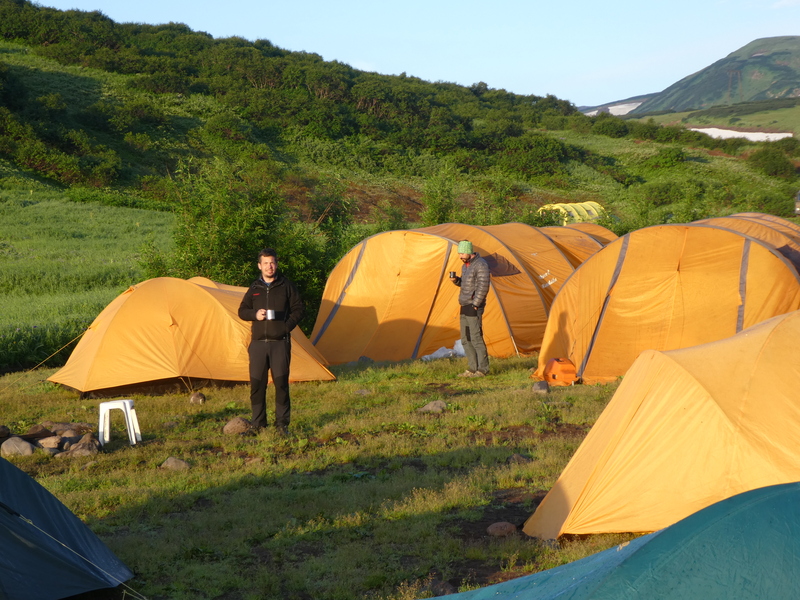 We get our luggage at an improvised luggage tent and meet our guides, Stephan and Sergej in the parking lot. 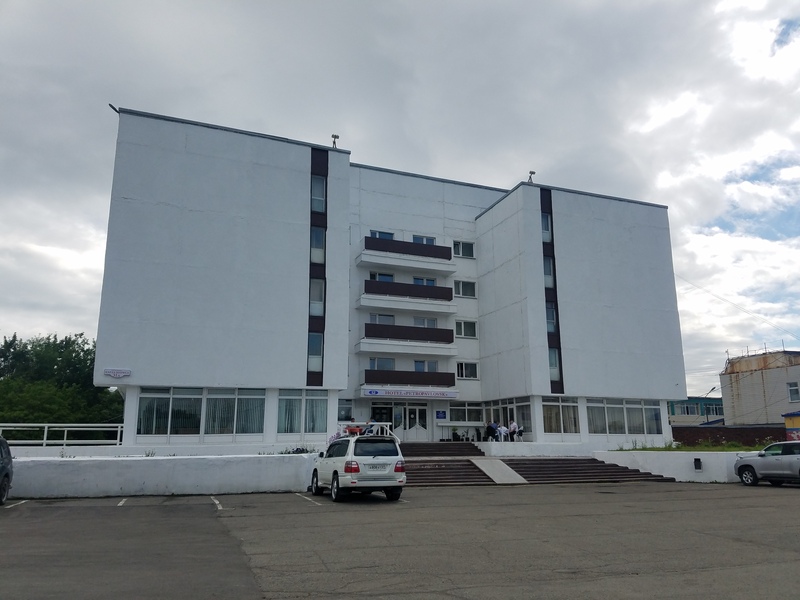 A taxi brings us to the hotel “Petropavlovsk”. After checking, we take a walk “downtown”, to buy some water and get a first impression of the town. Thick fog hangs over the city in the morning. Our goal is to fly to Geyser Valley, today. 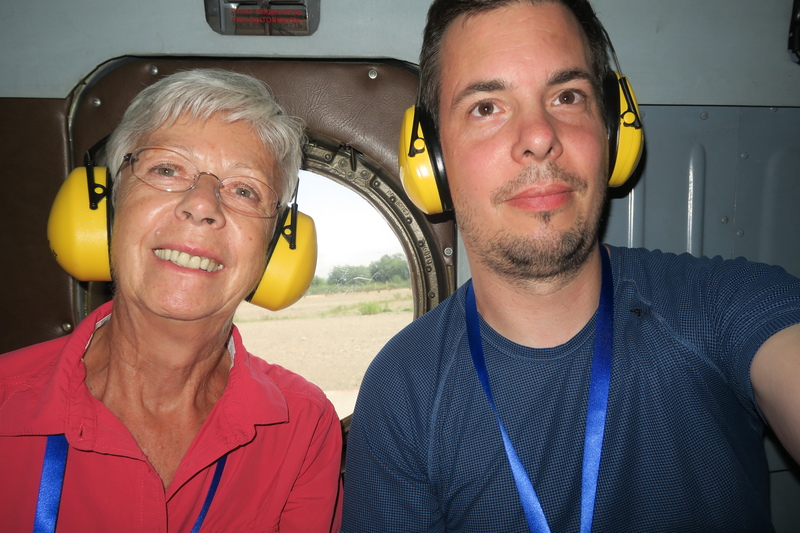 After an early breakfast, we drive to the heliport. There, we wait. For one hour, two hours, three hours. 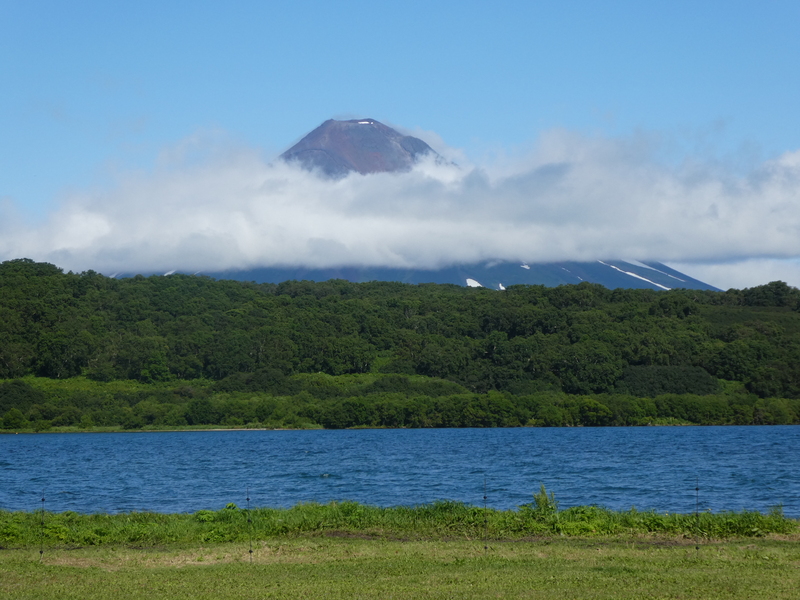 “This is Kamchatka”, our guide says and shrugs. At 13.00 it is clear that we cannot fly to Geyser Valley due to fog that is hanging in the valley. 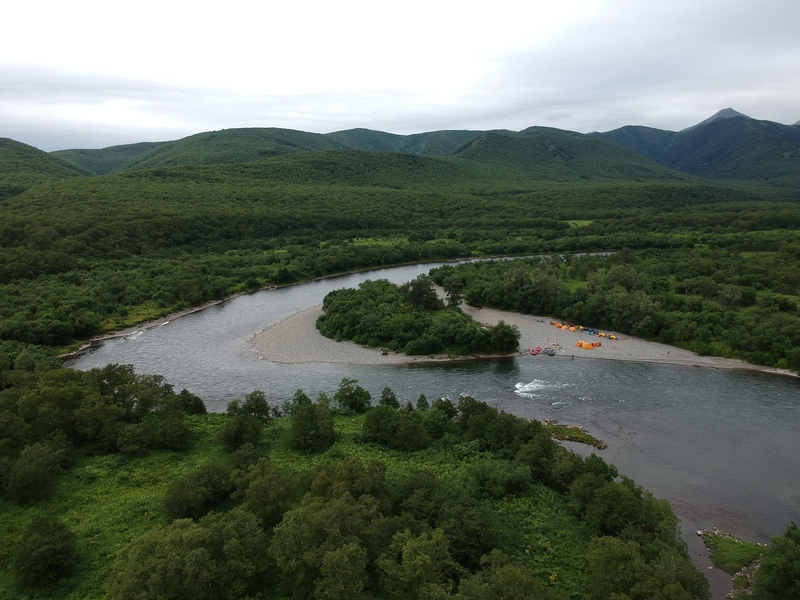 The helicopter company offers to switch destinations and go to Kuril lake, instead. 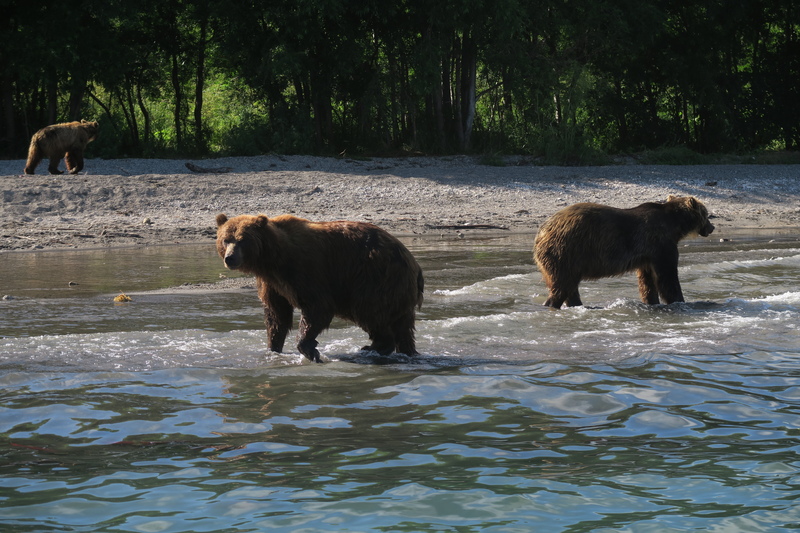 Kuril lake is the famous salmon rich water at the southern tip of Kamchatka and home to a large bear population, which feeds on the salmon. We decide to go. This means. we have to wait. 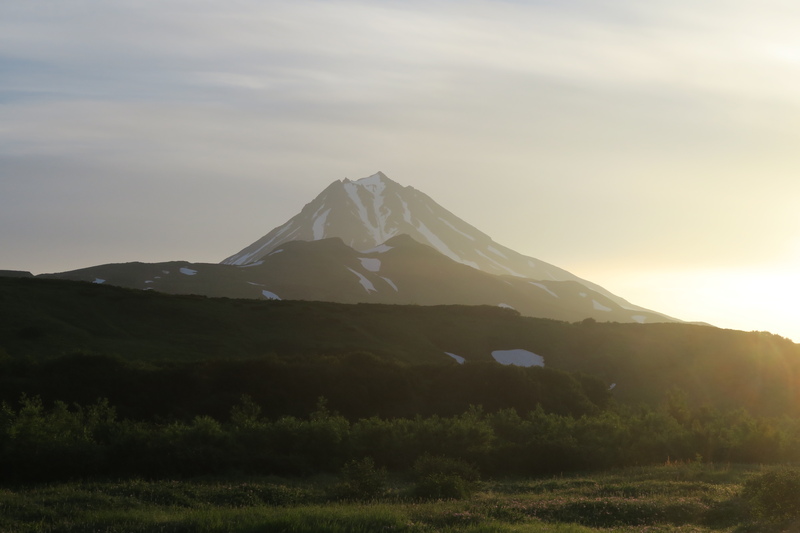 “This is Kamchatka”. 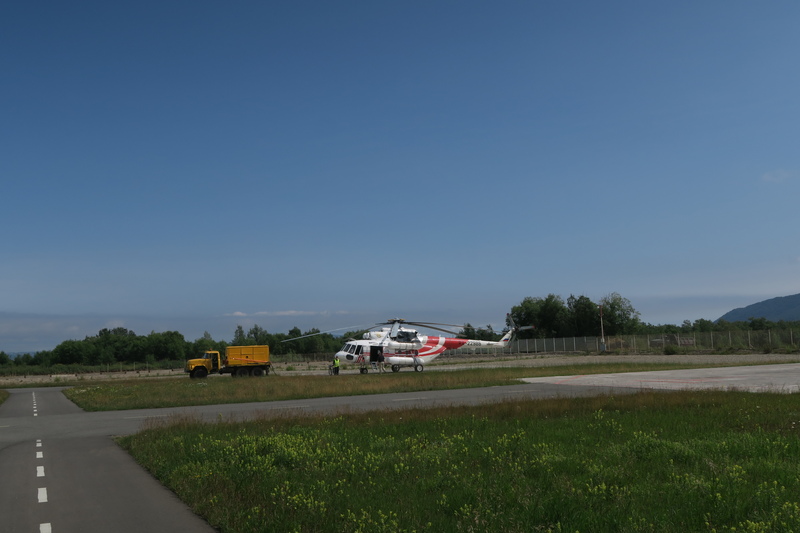 At 14.30, we finally mount an MI8 russian helicopter and take off. The flight is spectacular. The weather is clear in the South. 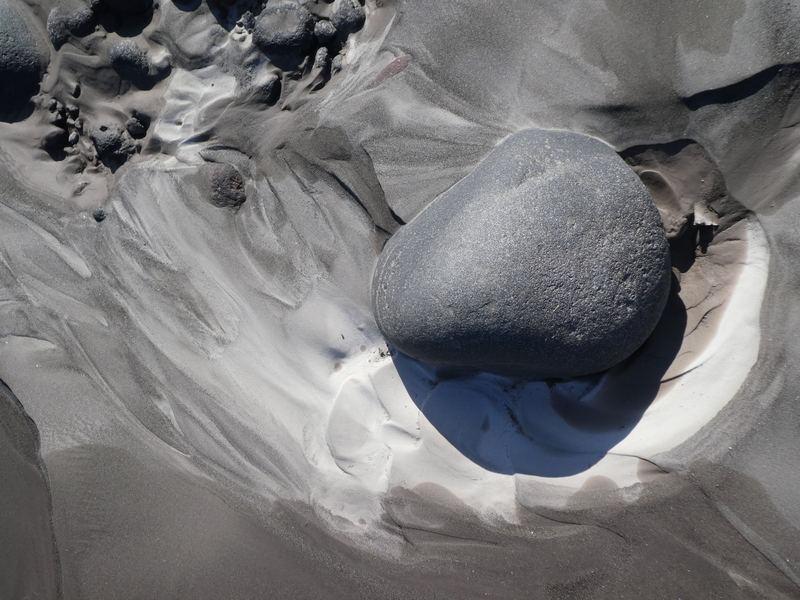 We fly low over volcanic landscape, past volcano cones and calderas over snowfields and rivers. 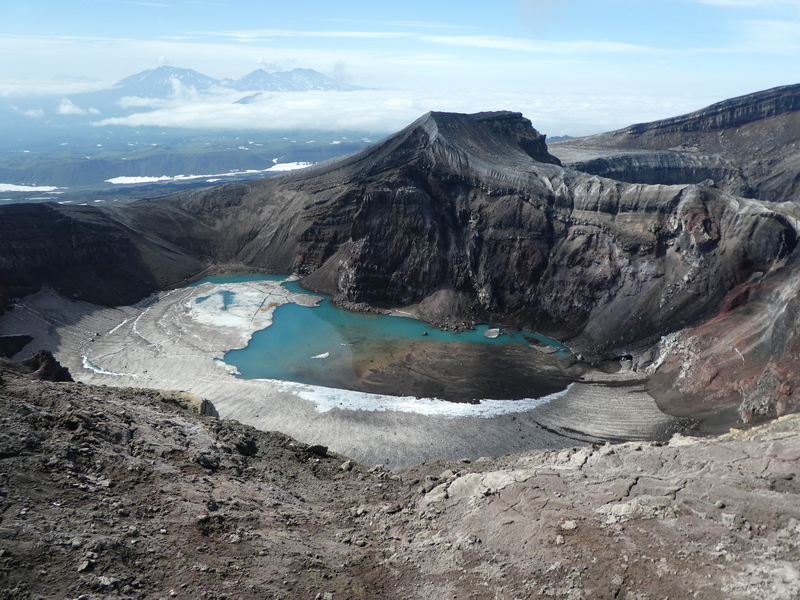 Our first stop after 45min is a caldera, a huge lake created by a caved-in volcano. 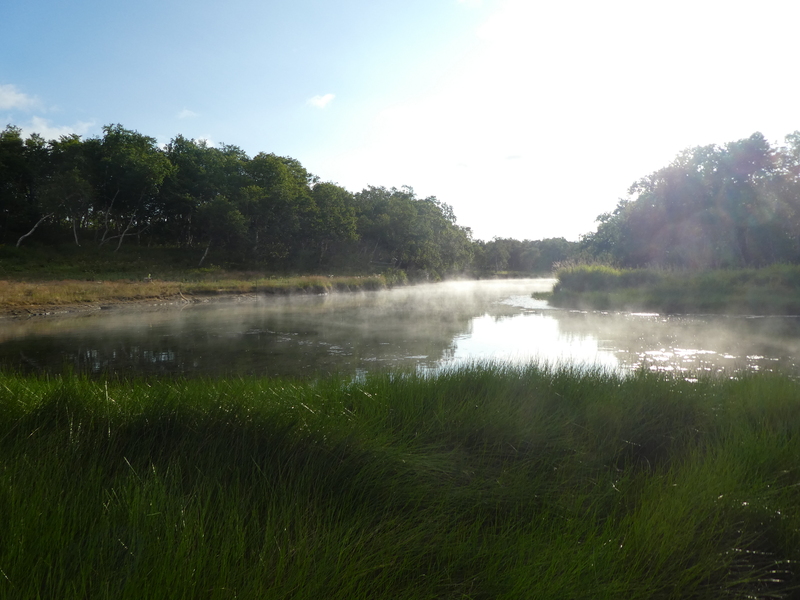 The water is warm; steam rises from the shore. 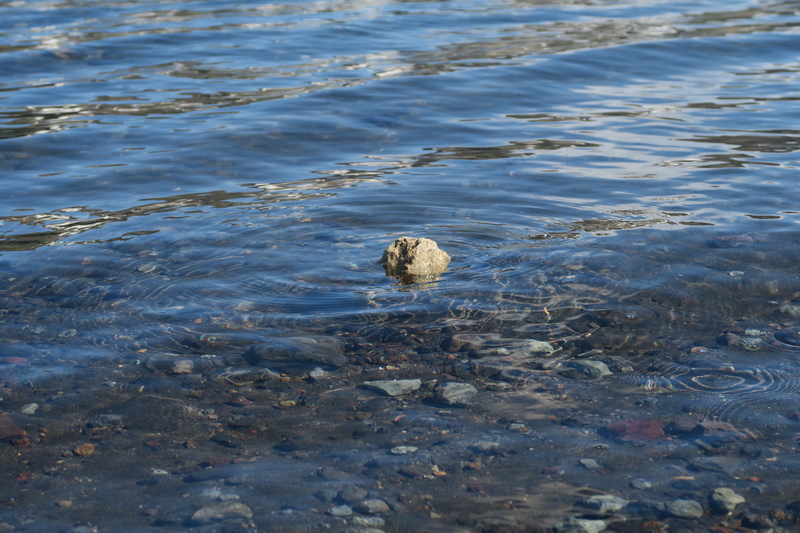 Volcanic rocks are light enough to swim in the water. 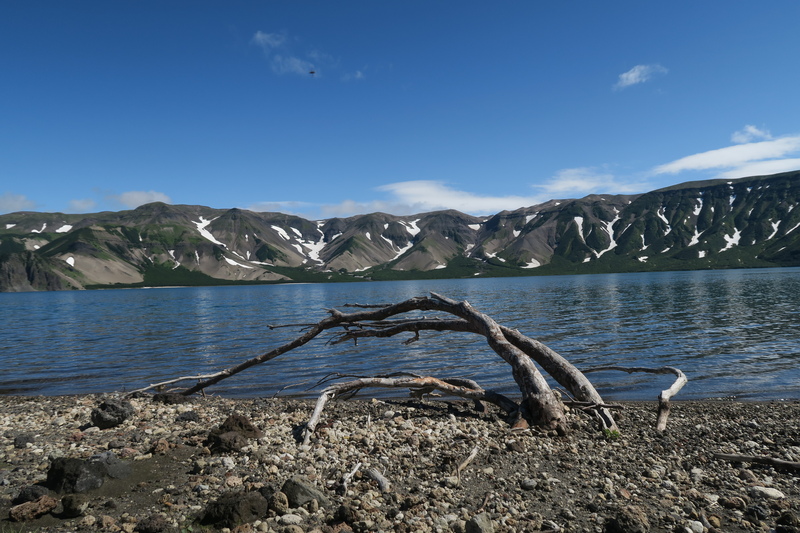 After 20min, we depart to Kuril Lake. 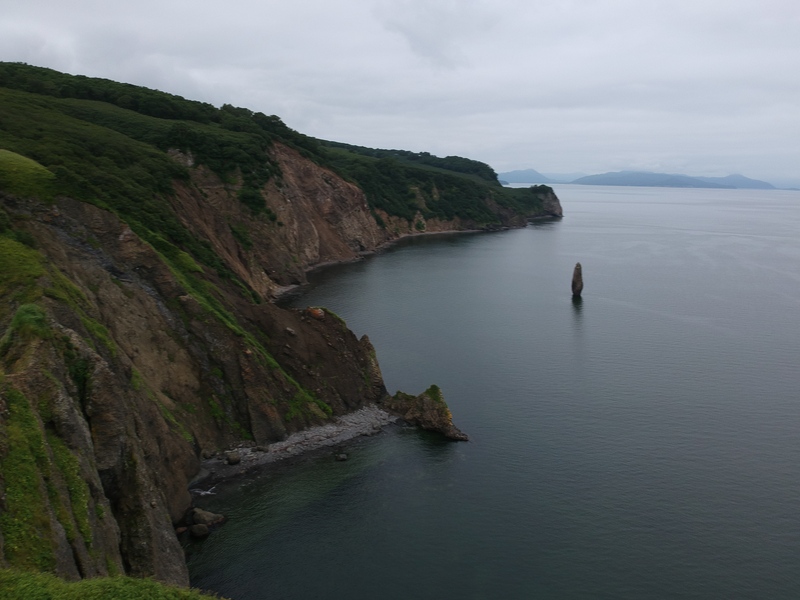 At Kuril Lake we are greeted by a Jurassic Park-esk scene. As the helicopter touches down, we are greeted by armed rangers who guide us through an electric fence to a “safe zone”. 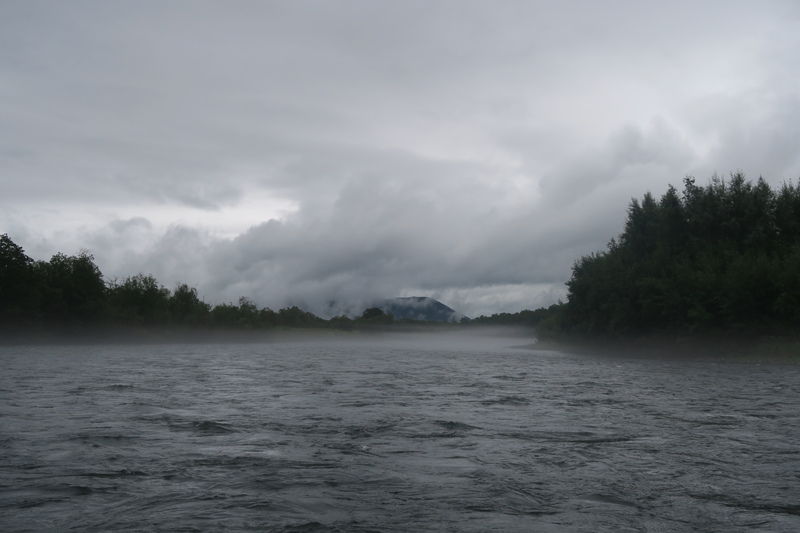 First we visit the Salmon river, just 100m outside the camp. 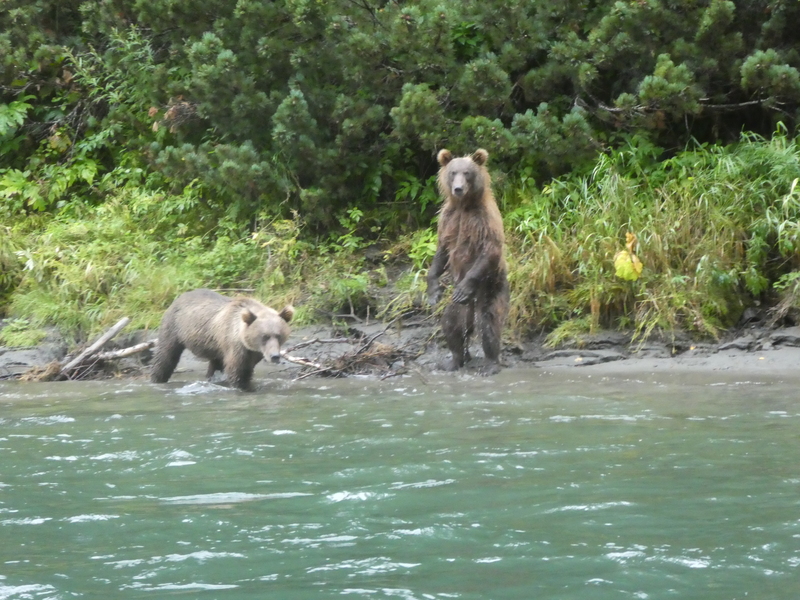 On the way there, we see our first bears, two ca. three year old males that walk on our trail. 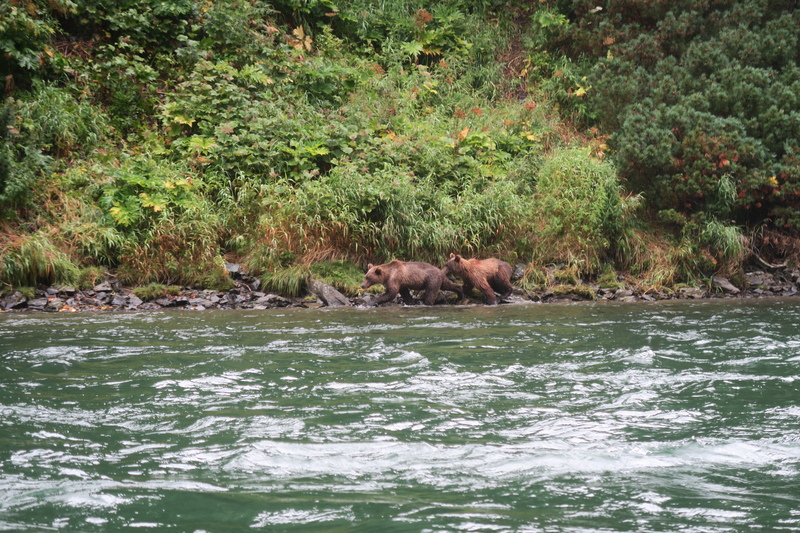 From the view point, we see maybe 10 bears, including a mother and her cups. The viewing area is secured by an electric fence. 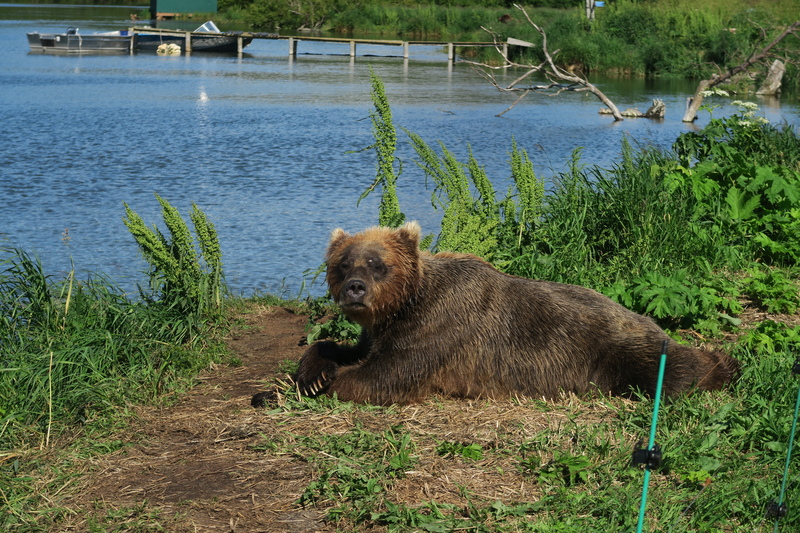 One bear takes a rest only a meter away on the other side. 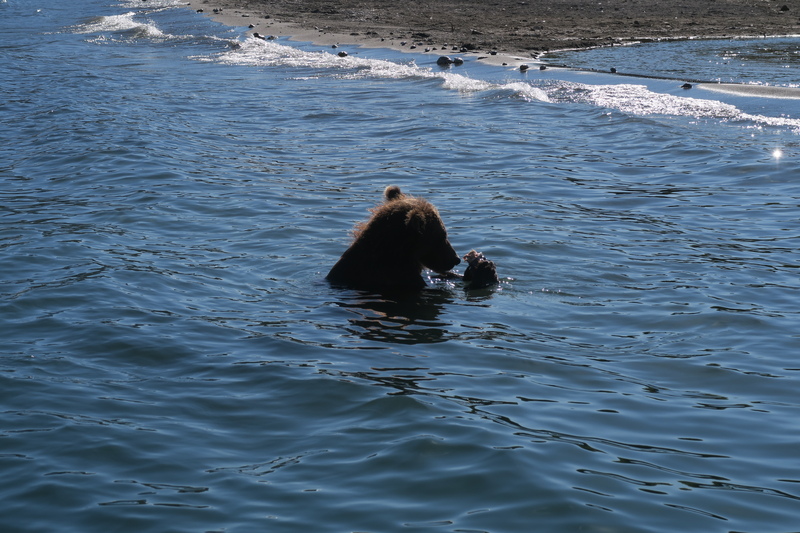 Second, we take a boat out on the lake to look for bears on the shore. 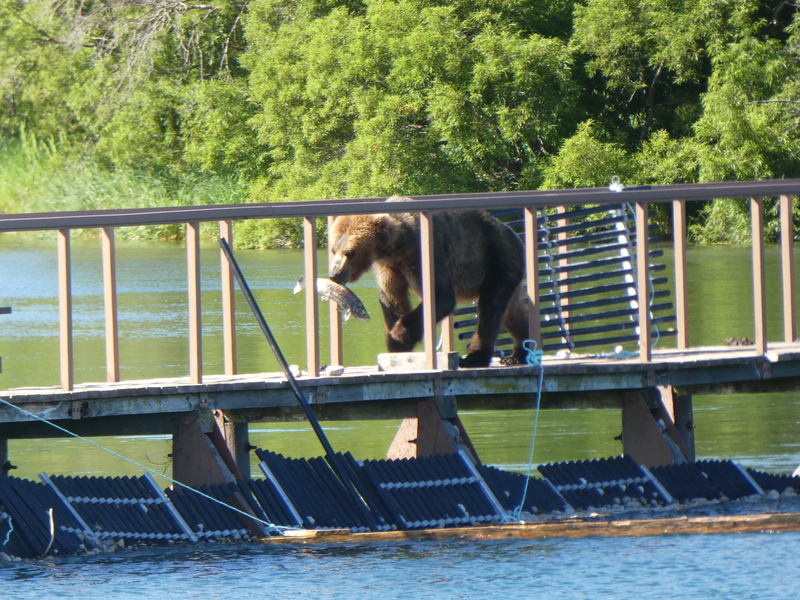 Sure enough, we find a group of 6 bears playing and fishing by the shore. Its a great sight in the already low afternoon sun. 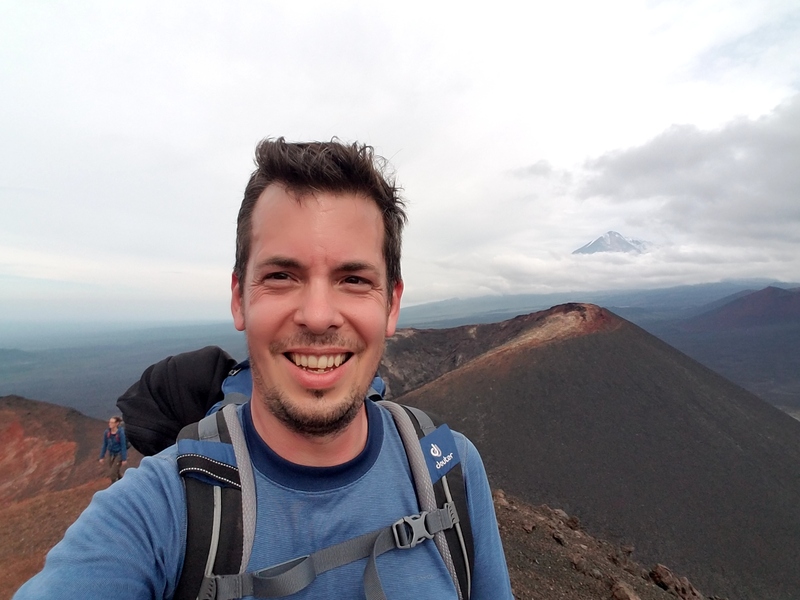 We make our way back to camp past a magnificent volcano at the lake shore. 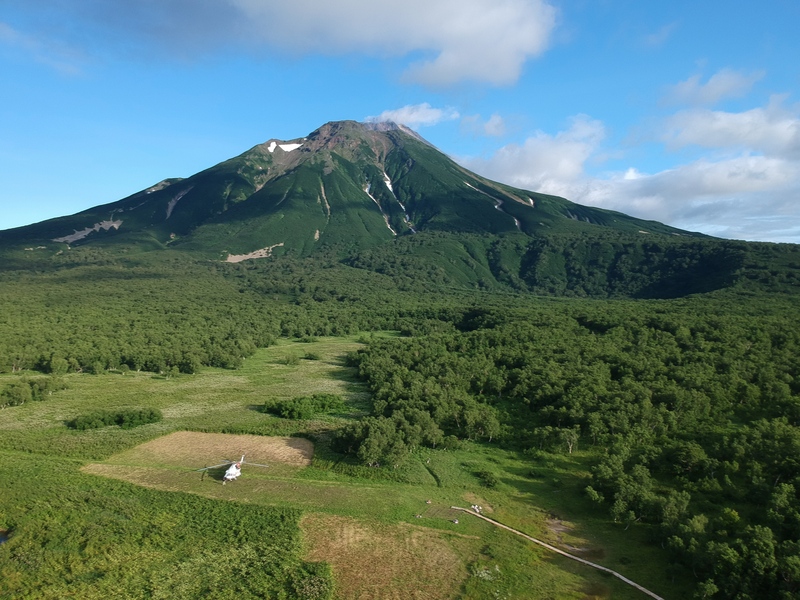 We depart Kuril Lake for another short flight to a hot spring. The water is easily over 40°C; too hot for me to fully dive in. After we are all well cooked, we have a simple salmon dinner before we fly back. We arrive back at the airport at ca. 20.30 and take the bus to camp, about 2h away. I have a bad headache, so I sleep most of the way. 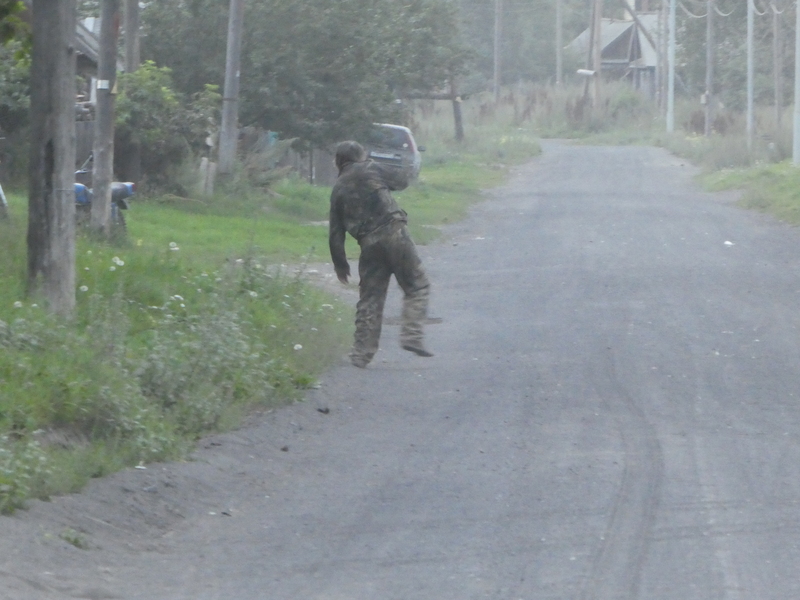 We go to bed immediately and sleep, while Russian campers blast 90s dance floor music – if nothing else, it keeps the bears away. 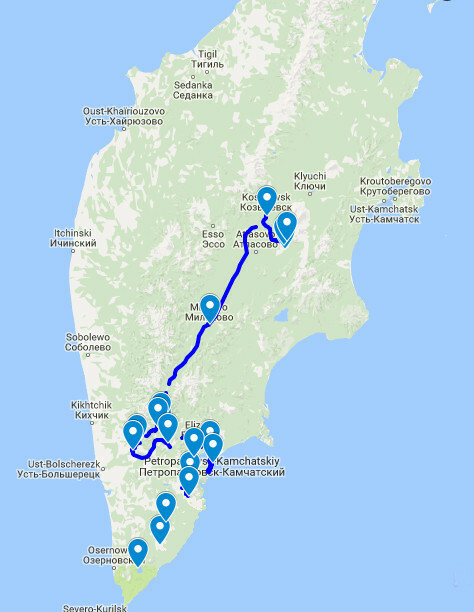 Today is road trip day. We wake up at 6.30. 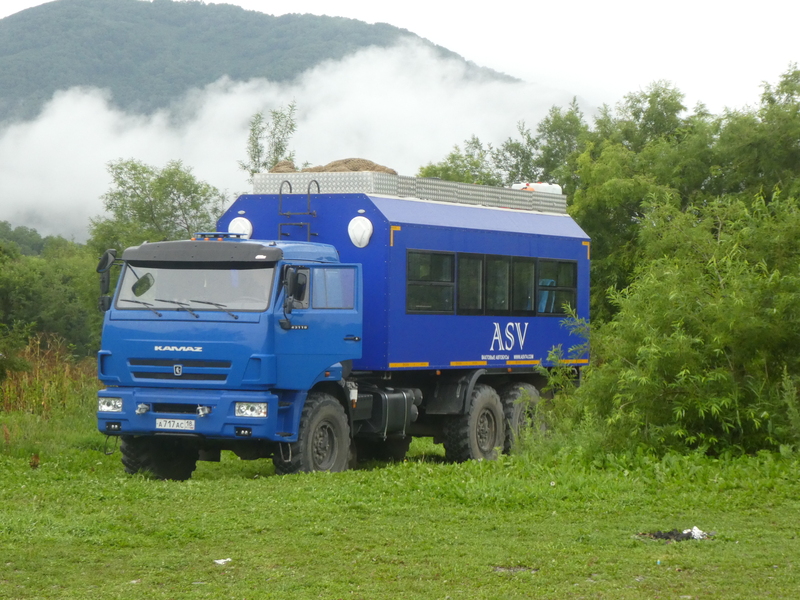 It takes 2,5h to have breakfast and load up the Kamaz “bus”. Then, we hit the road to go north. After a few kilometers, the asphalt ends and we hit the all to familiar dirt roads. 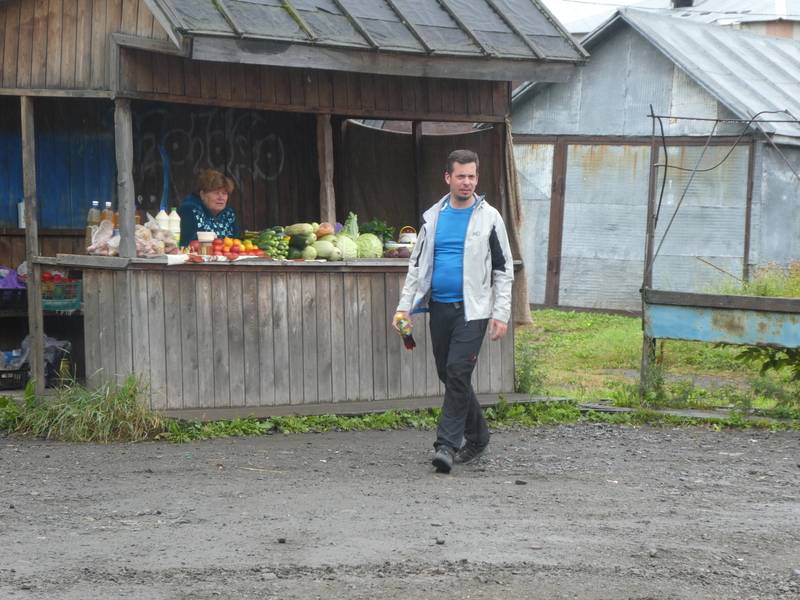 At 12, we take a quick lunch at a cafe in Milkovo – Sowjiet style with borscht – but the driver pushes to move on. At 16.00 we turn of the main road onto a forest track. Sometimes there are only centimeters between the truck and the trees. Its a slow drive. After ca. 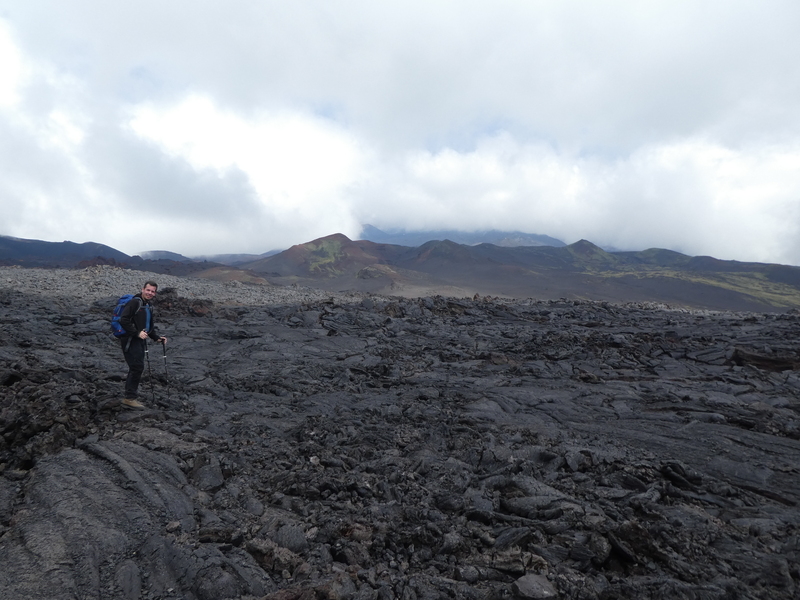 3h, we see the remains of a lava flow of an 2013 eruption. Some of our fellow travelers don’t take the drive to well and become see sick. Finally, the forest clears and we drive on a gigantic ash field of Mt. 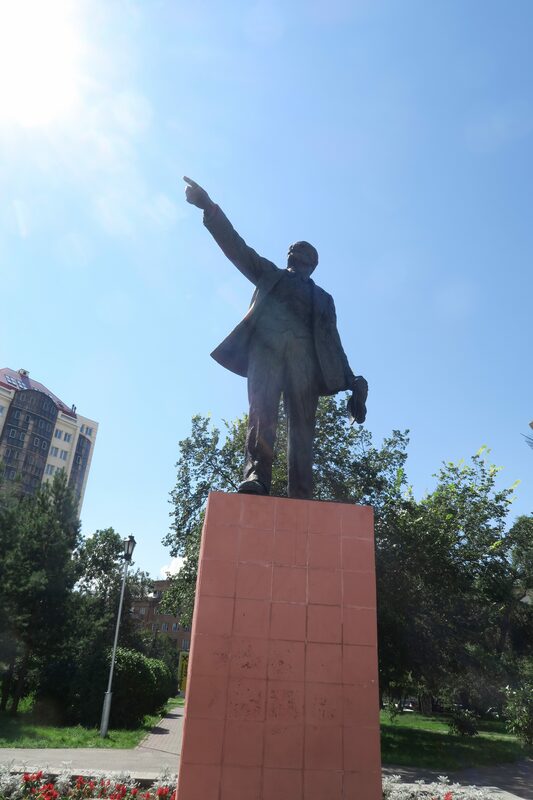 Tolbachik. Its right at sunset (21.00) and the moon landscape is bathed in a beautiful light. We arrive at camp, set up our tents and go to bed, after dinner. We wake up at 5.50, just in time to watch the sunrise over the camp. Its a slow morning. 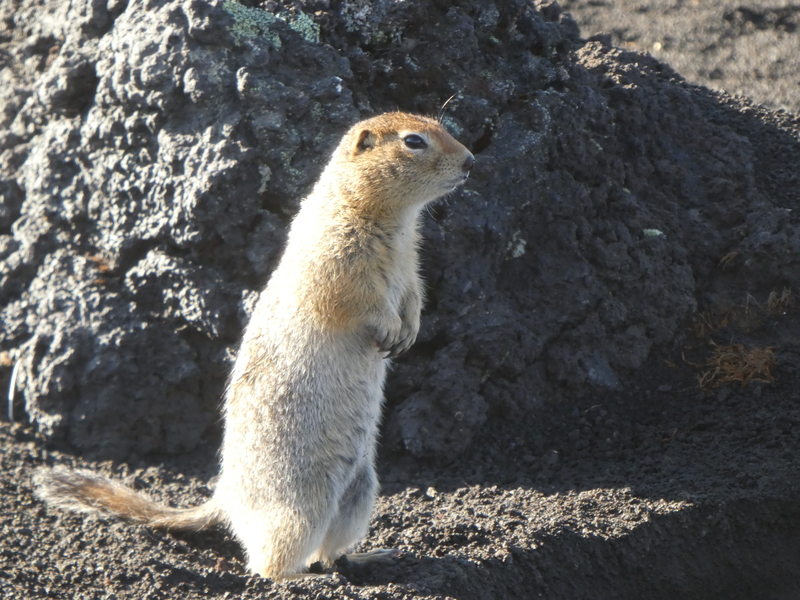 We watch marmots roam the camp and have a hearty Russian breakfast. 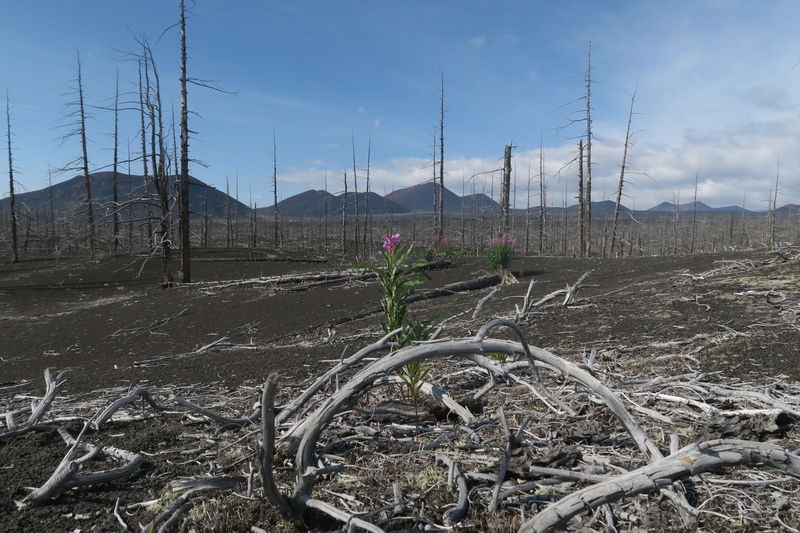 At 10, we leave for the cone of the most recent eruption, which lasted from 2013 to 2014. 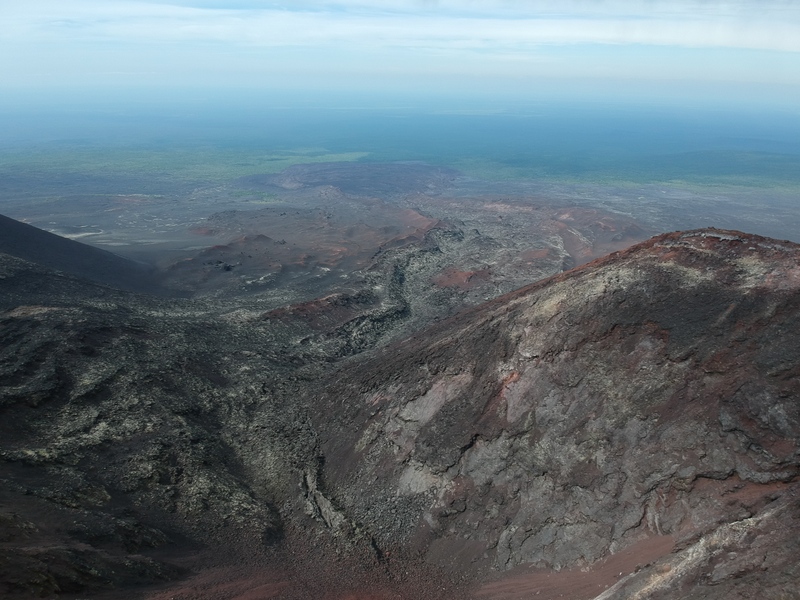 It produced 2 main lava streams, one 10km and one 17km long. The latter, we saw yesterday ob the drive, the former we hiked on, today. Both streams are “cold”. 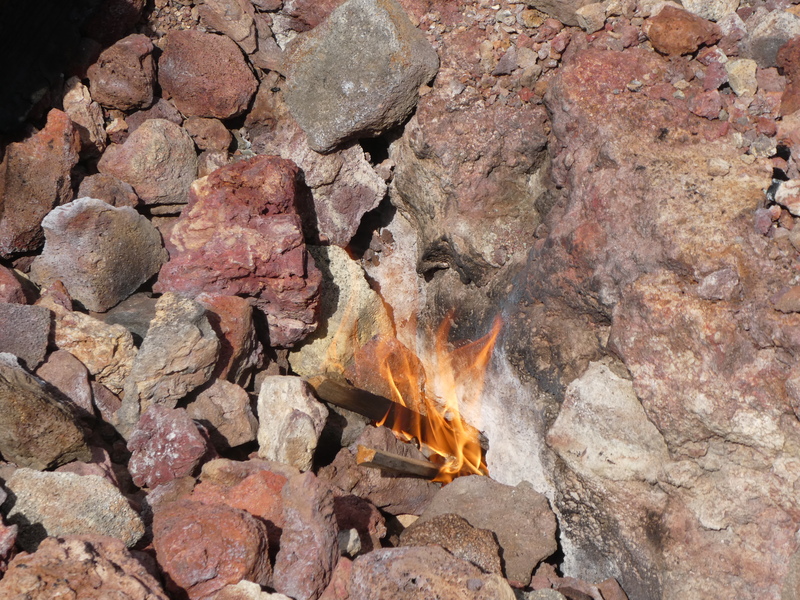 It takes about 20min from camp to reach the lava stream. We walk along its edge before we cross the field a few kilometers in. 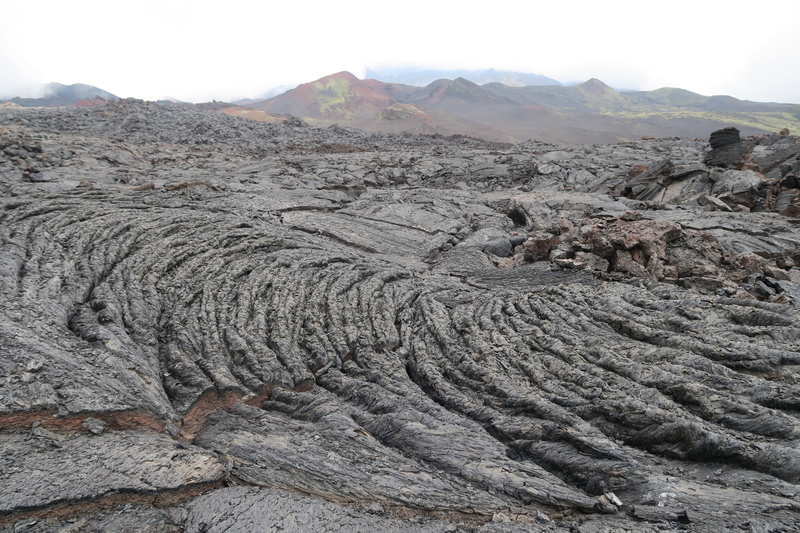 The ground is cracked and difficult to walk on, but lava shows many formations. In some areas, the ground is still warm. 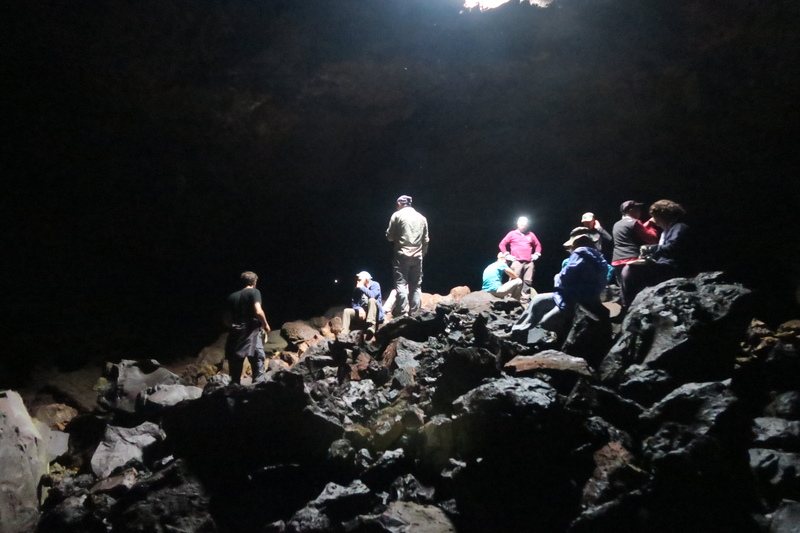 We climb down a hole of an underground stream, caused by magma flowing underneath the cooling lava. 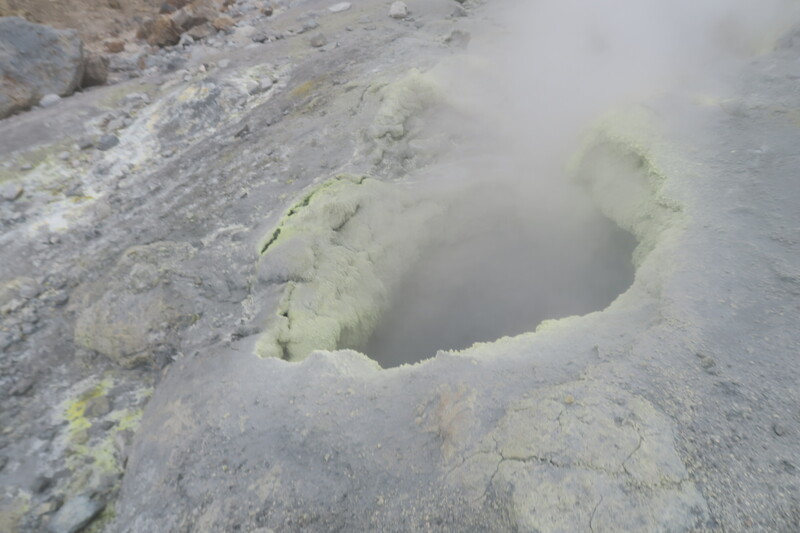 When these streams subsided and cooled, they left tunnels under the lava field. In the tunnel, its very warm. 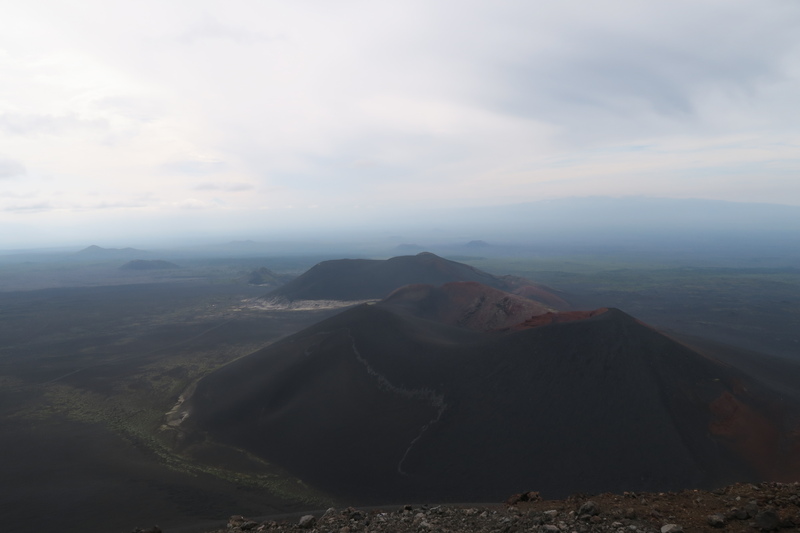 We cross the field and hike up the volcano cone, which was formed in the eruption. 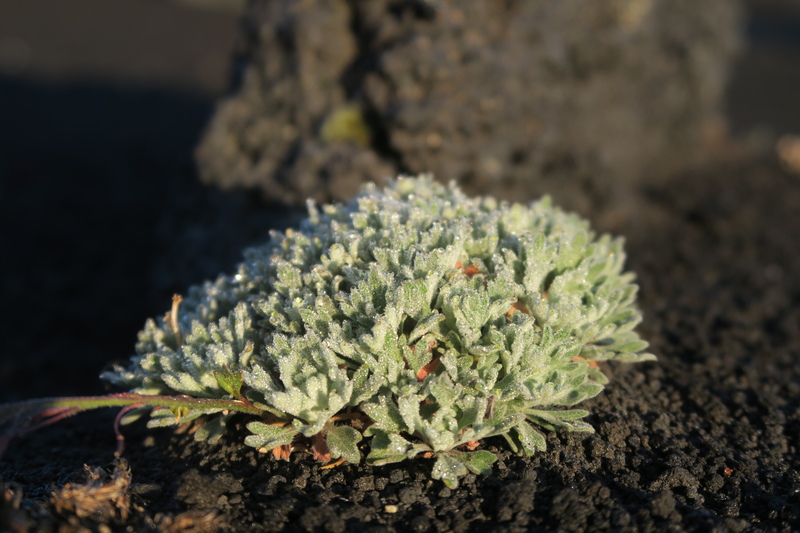 It is about a 300m cone (1730m above sea level) with a main crater and a side crater. 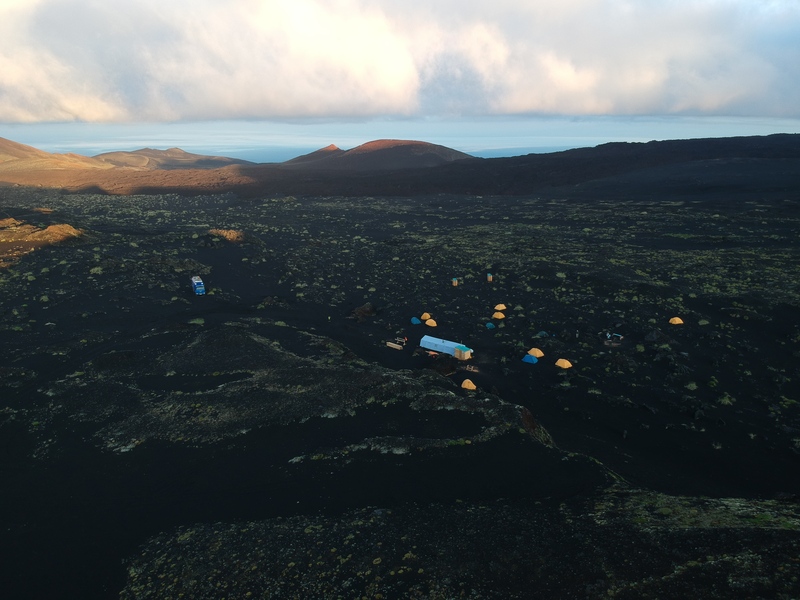 We have a stunning view over the lava field. 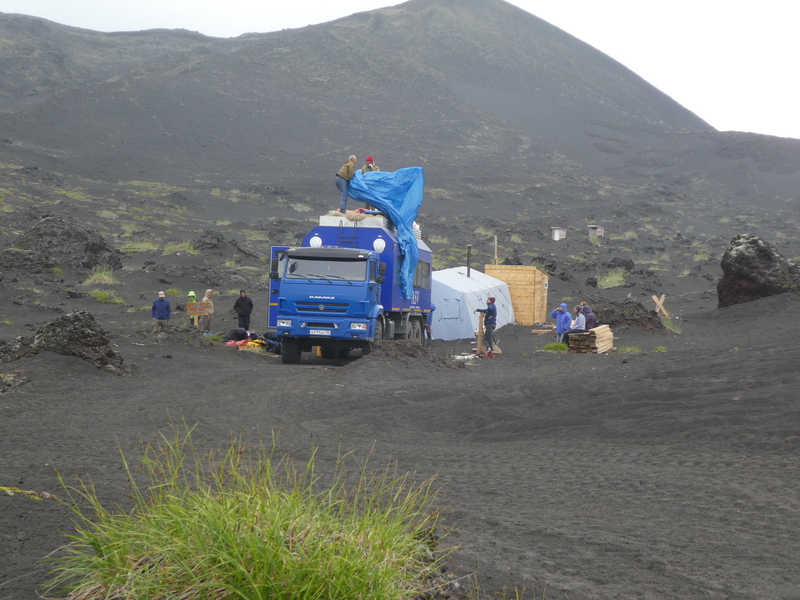 Back at the base of the cone, we have lunch on the lava sand, before retracing our steps. We check out another lava tunnel and follow its cave for maybe 400m. Its wide enough to walk in and ends in a gigantic cavern. 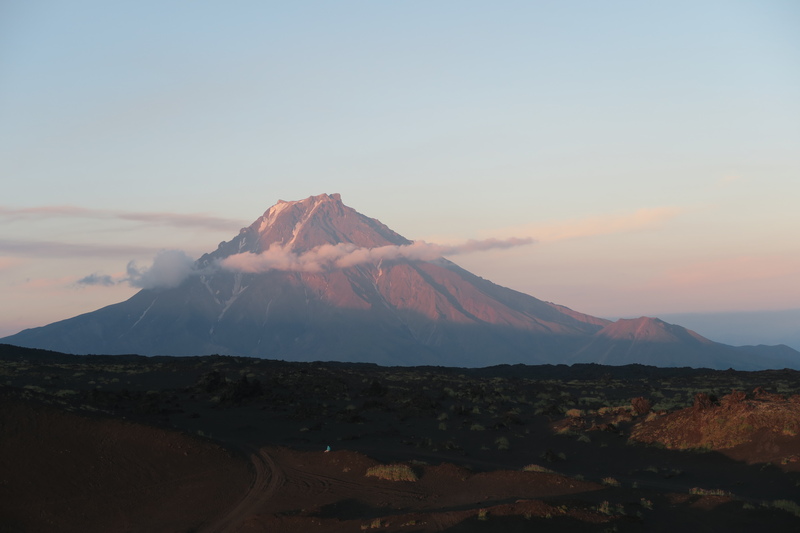 After this cave adventure, we head back to camp (reach at 17.00) to enjoy the evening sun, have dinner, take some sunset photos and sit by the camp fire. Late start as we aleep in until 8.00. 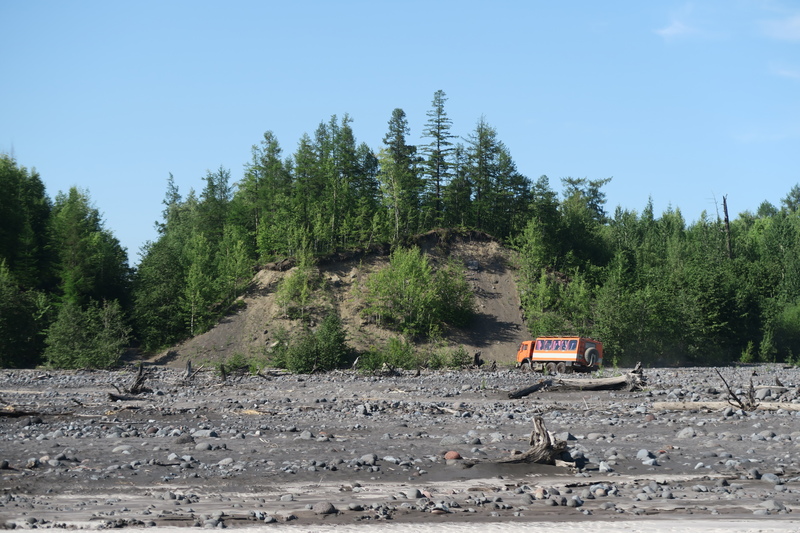 After breakfast, we take our truck (probably most modern Kamaz Truck in Kamchatka) to a shield (=line) of 7 volcanoes and, particularly a double cone that erupted in 1975. The climb to the first cone takes about 1h. The earth is still hot after 41 years. So hot in fact (400°C), that Sergej lights a fire by simply sticking some firewood in the ground. 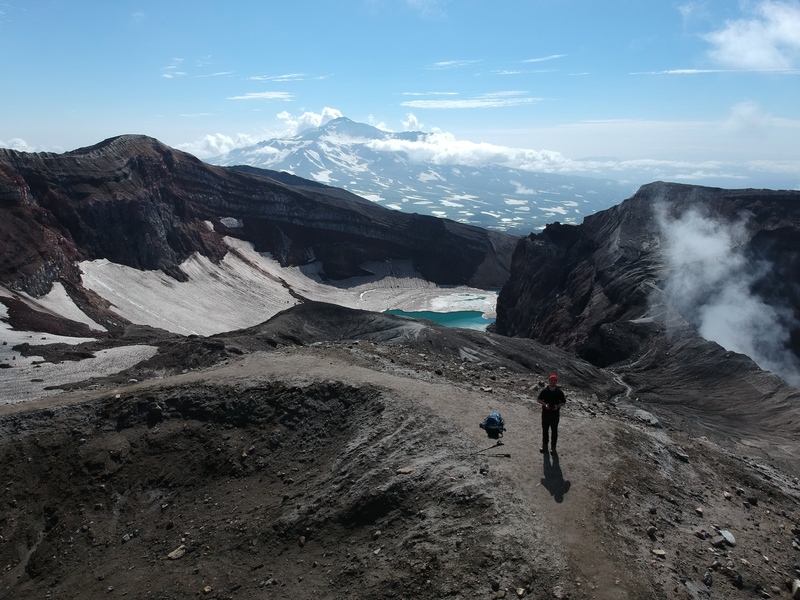 From the top, we have an amazing view over the giant ash field between the vulcanoes to the East. The cone broke to the West and the lava spillage looks like wax that spilled into the woods. 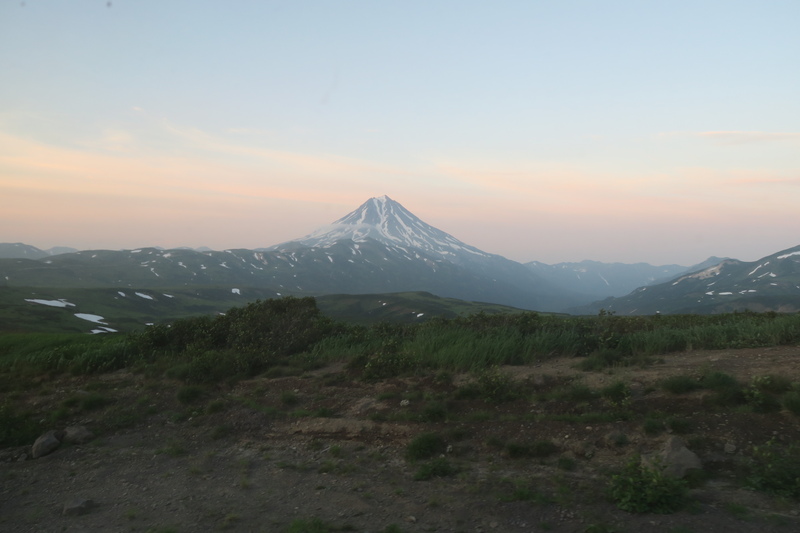 We hike to the second cone, which offers again a great view over the ash fields as well as the dead forest. We rest on the warm stones at the second cone, before hiking down to the truck. The hike takes 3h in total. In the morning we break camp. The truck is loaded by a very grumpy truck driver. Hierarchy is clear: Driver stows, Sergej oversees and Stephan works. 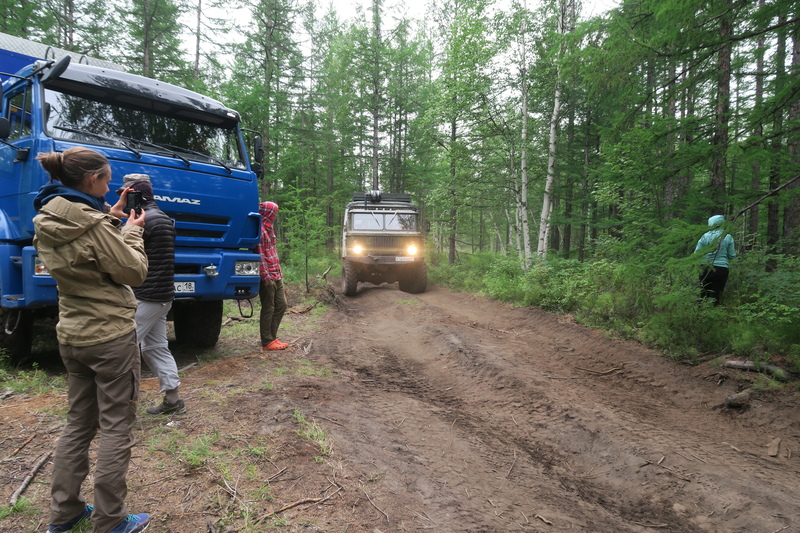 At 10.00 we leave the camp and, after 45min, reach the forest road. For almost 5h, we crawl almost at walking pace. We stop for lunch on the river bed. After the river, the road improves significantly. Ca. 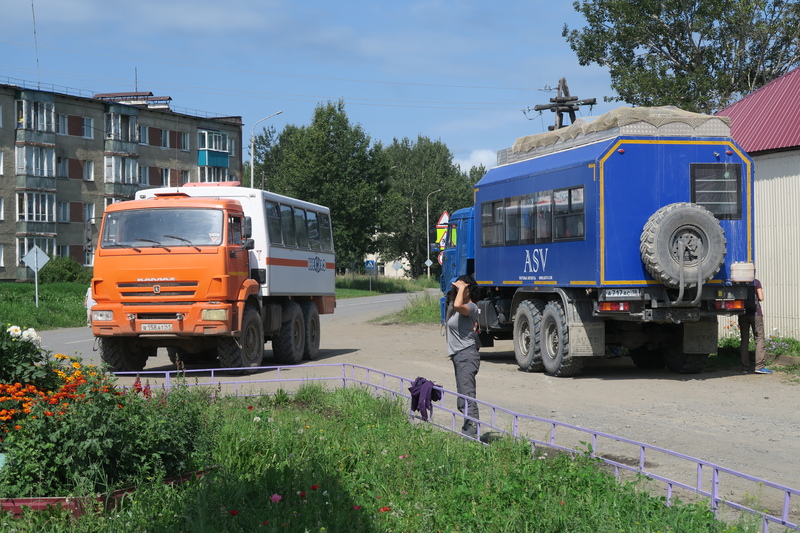 1h later, we hit the main road and arrive at Kosyrevsk at about 17.00. 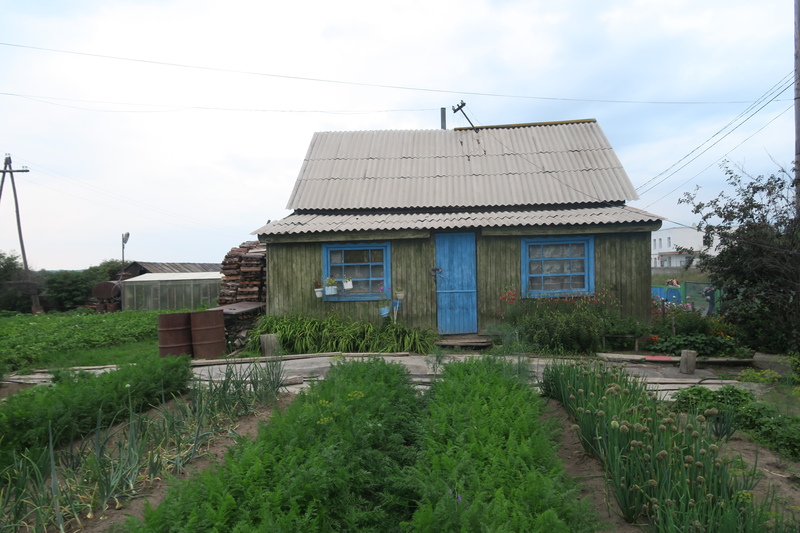 Kosyrevsk is the oldest town in Kamchatka, founded 250 years ago by the indigeneous people. Today, the town’s population is declining and currently at 1.000. We stay in small 2 person guest houses on main street. The owner prepares the Banja for us; the first wash in 3 days. For dinner, we try different caviar before the main meal. 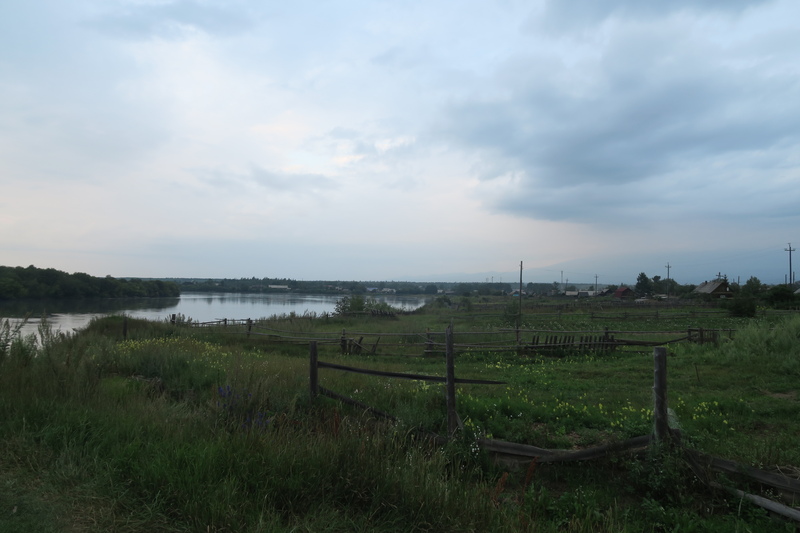 After dinner, we walk to the river, from where we can overlook the town. A view we share with 1bn mosquitoes. We buy some additional bug spray. We spend the evening on the porch, talking and killing mosquitoes. We have an early breakfast at 7.00, in order to hit the road to Malka, to start rafting. Over night, it started to rain. 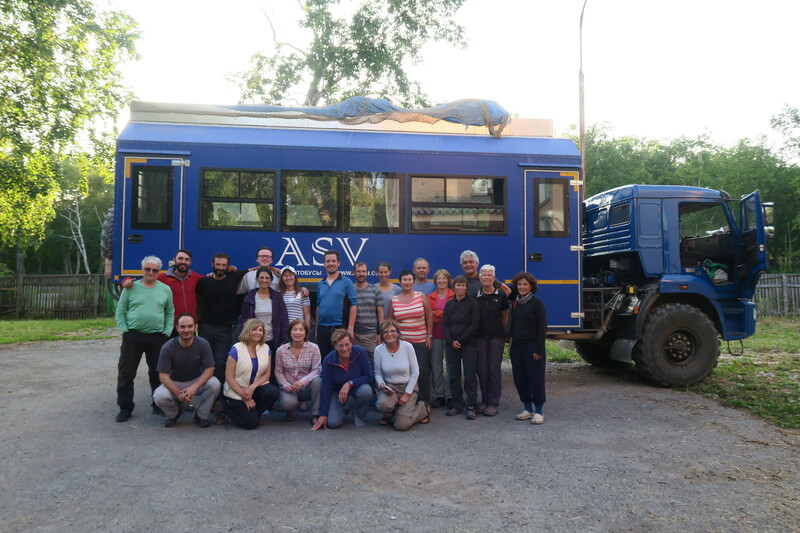 After breakfast, our guides take another hour or so to load the truck and we hit the road at 9. 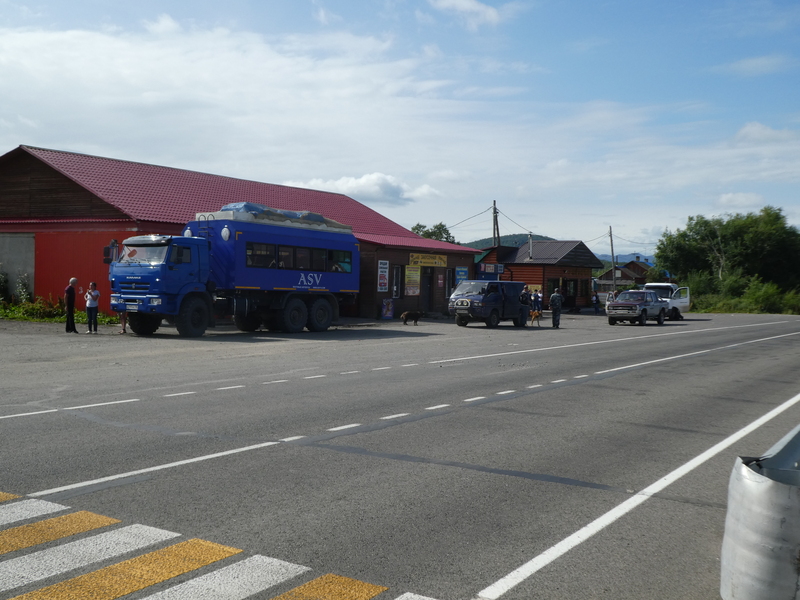 The truck driver finds his racing gene and we drive the 160km to Malkova in 2,5h. In Malkova, we have lunch at our favorite local cafe (the only one there is). Shortly after finishing, a cleaning lady shoos us from our table, loudly. Make room for other people. We drive onward on the road that, after the drives through the forest, feels like the Autobahn. 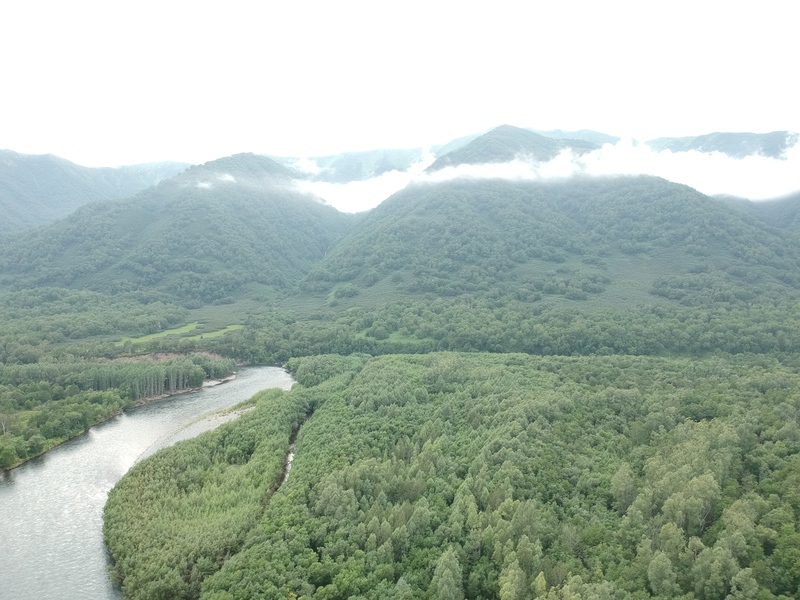 The landscape changes, again, views become wider and we see the mountain ranges to both sides of the valley. 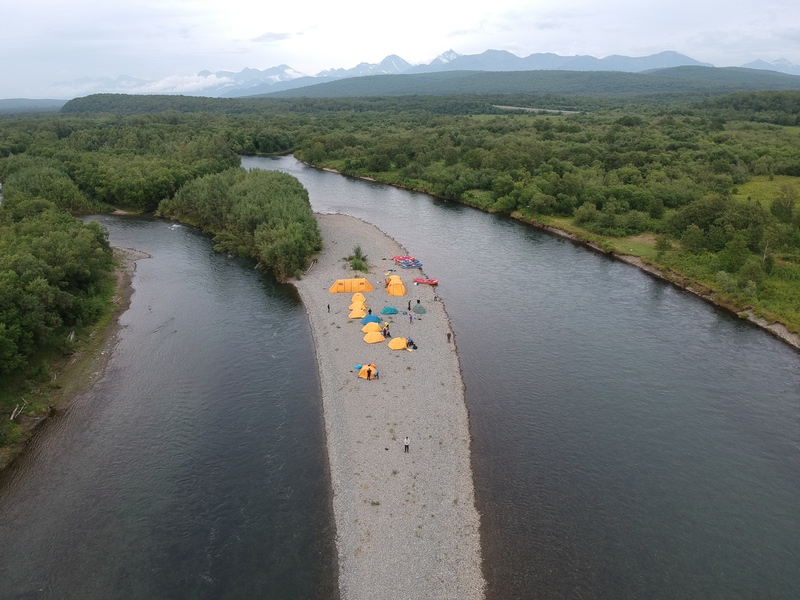 At 16.30, we reach the rafting landing site. We repack our packs into waterproofed bags, put on hip high rubber boots and load the luggage. 1.5h later (!) we take of. The scenery is beautiful. The river winds through forest and meadows. It flows quite fast, possibly 6 to 8km/h. The first rapids are easy to maneuver. This makes it a relaxing ride. 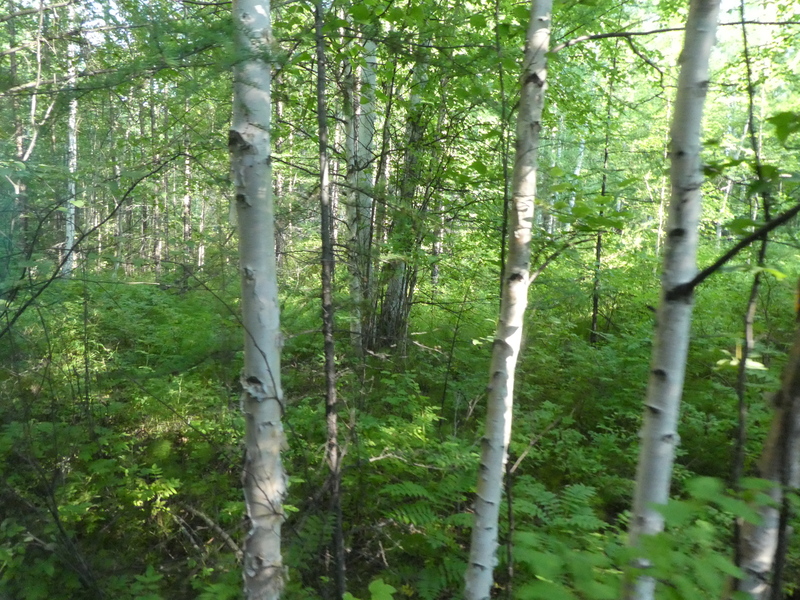 We see a young bear at the shore, which quickly disappears into the shrubbery. 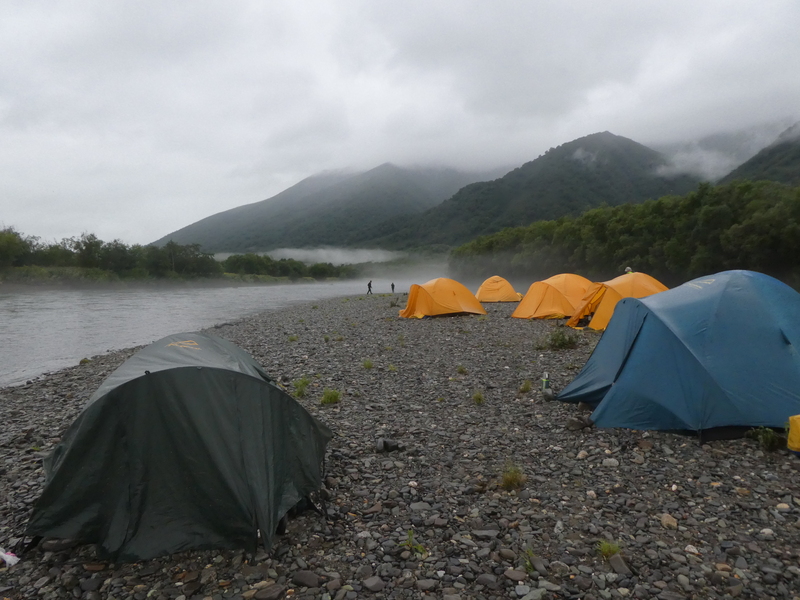 After about an hours ride, we make for shore on a small island in the middle of the river, where we build our camp on the stone bed. I spend the evening fishing (unsuccessfully). 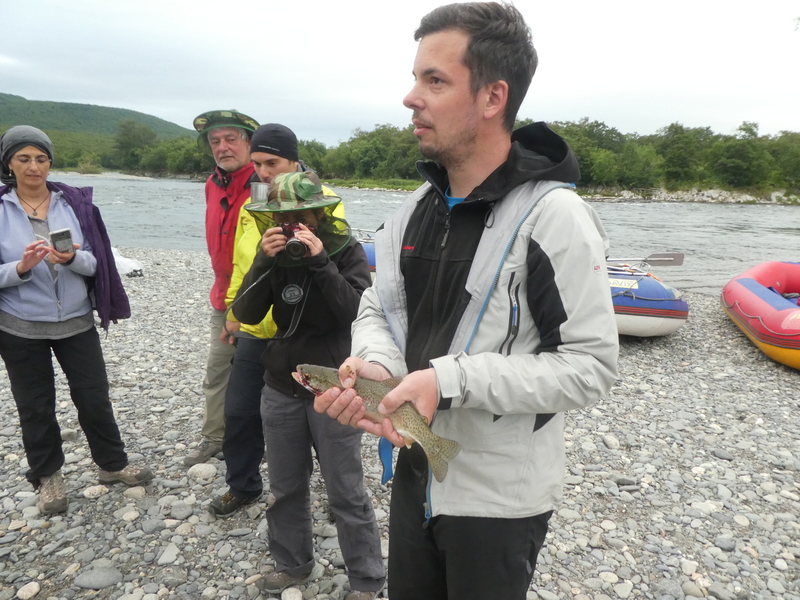 But our guides find two large salmons, leftovers from a bear, close to camp and dump it in the river. Fish soup dinner and of to bed. I want to go to the toilet at 6.30, long before wake up time. My right shoe does not fit. I stick my hand in and touch something warm. Another prod, a small bite and a mouse runs out of my shoe. After this, I decide to get up. 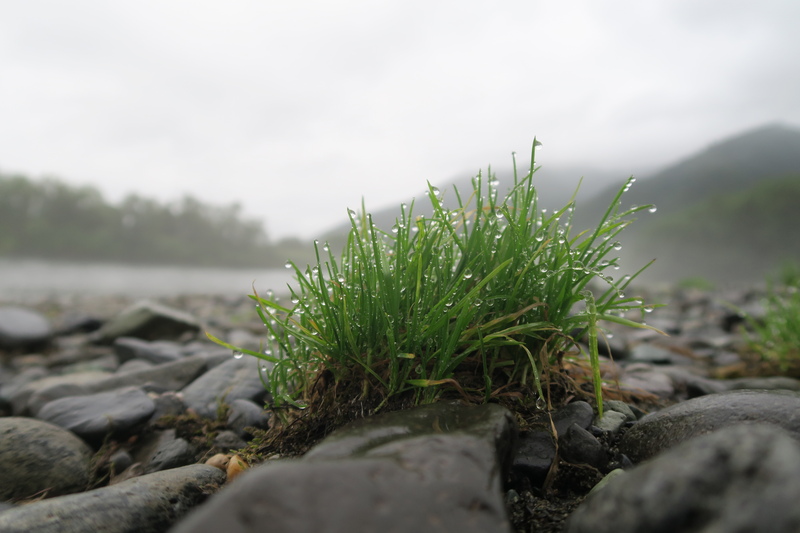 Its a misty and rainy morning, which makes again for a beautiful scenery. We drink tea and enjoy the morning. After breakfast, we pack the rafts and head out. We are now six people paddling and can manage the heavily packed boat well in faster water. Dark clouds and a clear line of fog hang over the river. Around our camp, many Kamchatkans spend their day fishing; we see maybe 30 people on the shore. Dark clouds turn into rain. At noon, we see the first bears. Two three year old brothers walk the right river bank. 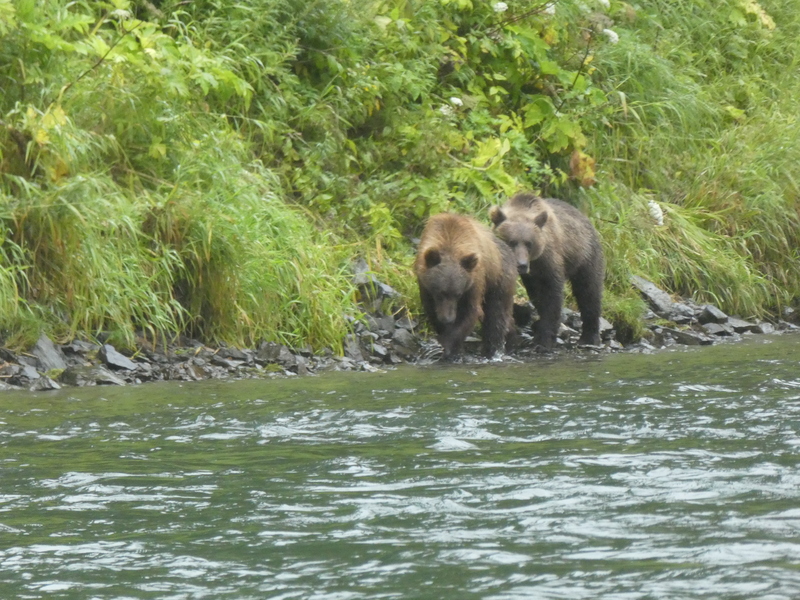 We will see 8 bears before lunch, among them a mother with three cups. and another four in the afternoon. A large group occupies the lunch spot, so we clear out some shrubbery to make our own. Again, our two cooks have surpassed themselves and prepared a great, warm lunch, to which they call with a loud and warm hearted ” Bon appetite”. The rain has subsided, clothes have dried a bit. Its a beautiful atmosphere on the river. In the afternoon, I take over the fishing rod from Mateo, an Italian chemist. Like him, I catch nothing. Only to bites create some excitement but I cannot hook the fish. 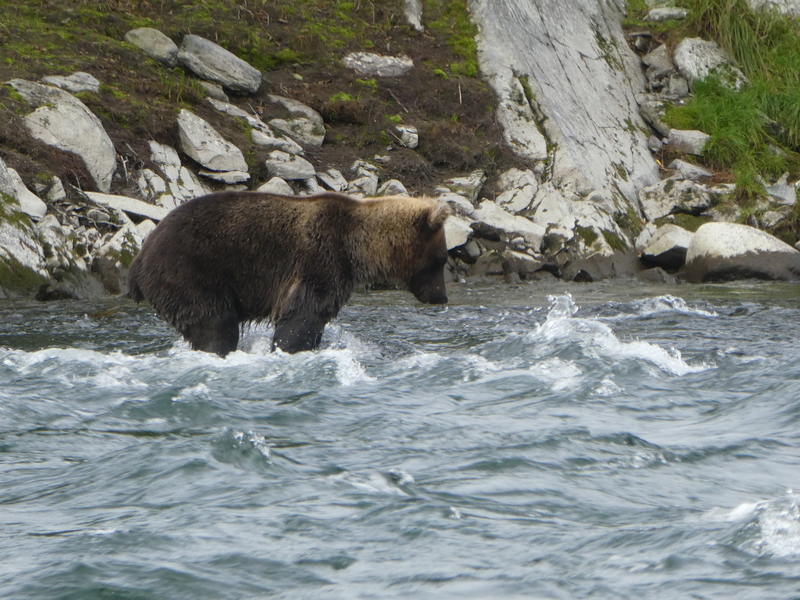 We see more bears as we continue through the ravine. The rapids are mild and easy to navigate. Its fun to row with Stephan. Be it is commands that mimic a race start: “Get ready! aaaaaaad one”, his concentrations on stories as the boat drifts close to shore ” Deep conversation. Lets row” or his stories “3 little bears live in a cabin in the woods with their mother and father. The ask their mother ‘ tell us a story’ The mother takes two human skulls and make them talk:’ No, honey, there are no bears in the woods'”. At ca. 18.00, we land at Bear Point. 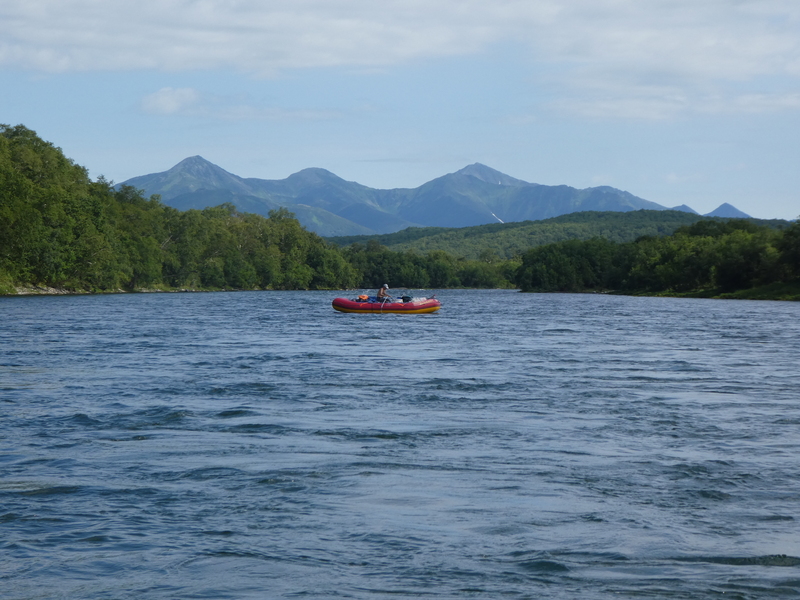 Its the inside tip of a sharp turn in the river with a rapid in front of the camp. When the water is high, our campsite is flooded. It becomes clear, why the site is called Bear Point: A pile of Bear dung marks the center if the camp. While we unpack, Mateo catches the first fish, a Greylin. I join him and after a while, we both catch a trout, each. The trouts are cooked in tinfoil in the camp fire, the Greylin prepared as Sashimi, as it is a fish that is free of parasites. We go to bed at ca. 22.00 and fall into a deep sleep. We had a visitor in the camp last night, but it left no trace other than a pile of fresh poop a few meters from the tents. 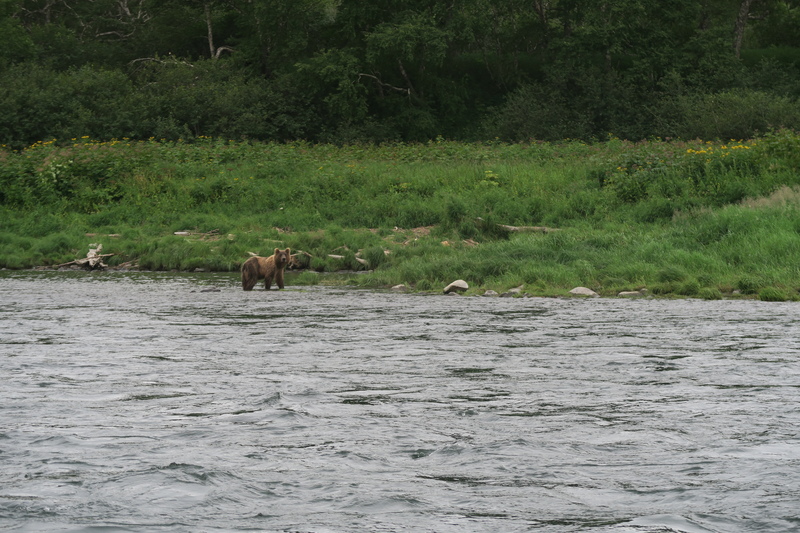 While we pack a bear appears in the opposite river bank. 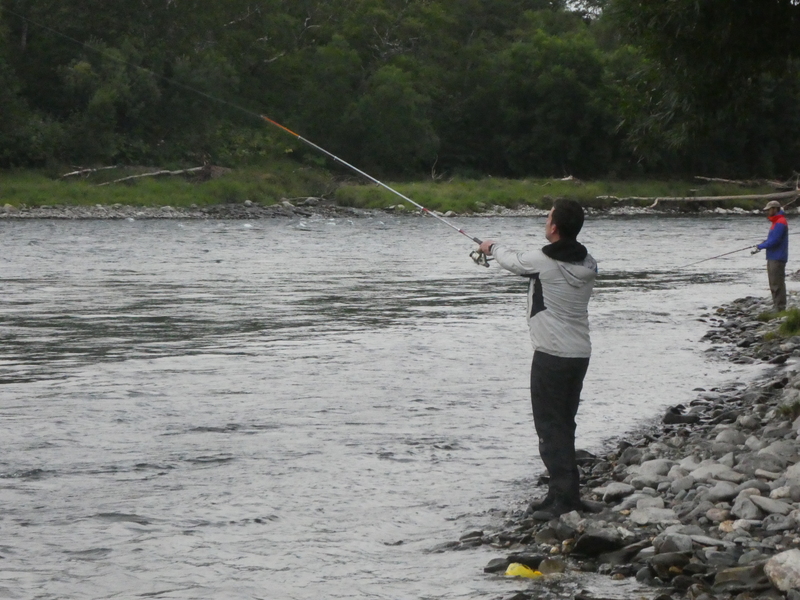 A bit later it crosses over to where we fished yesterday. 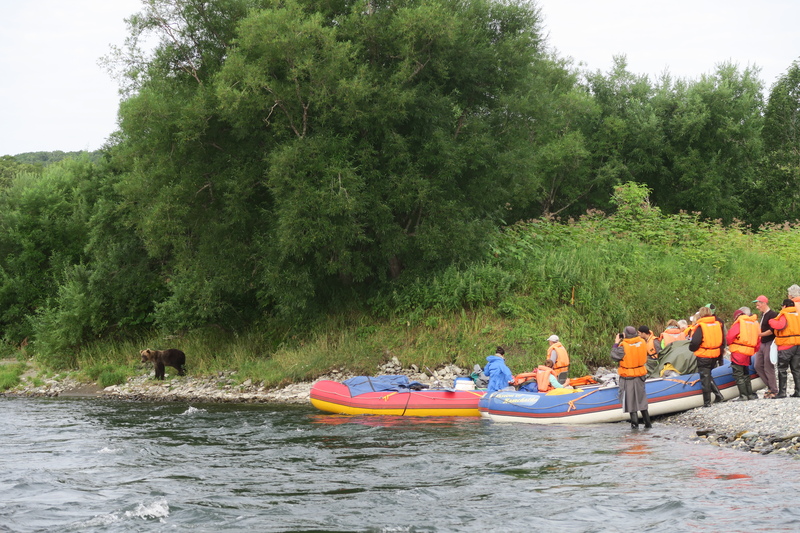 As we are ready to leave, the bear comes within a few meters of our group but then takes of. The sun is shining as we hit the first rapid. 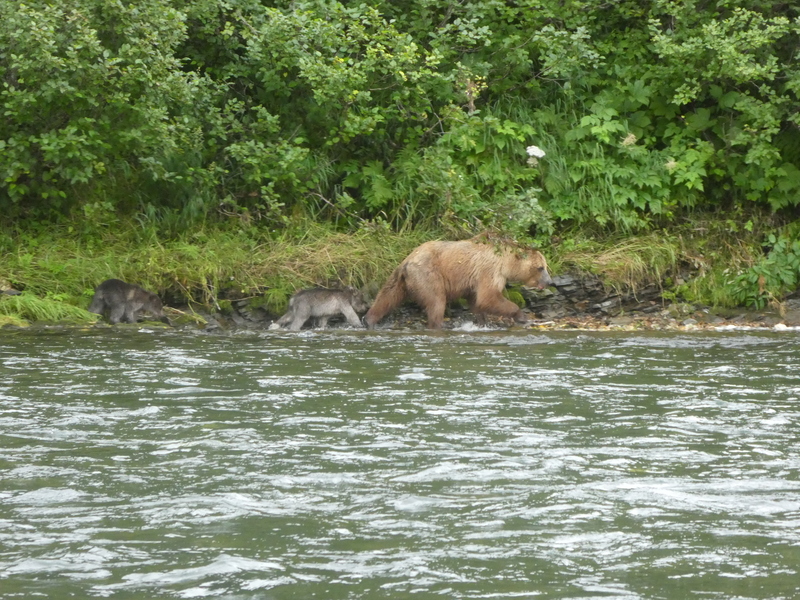 It is a very relaxing day on the river with little distraction; no more bears or caught fish, only a lazy salmon swims by upstream. 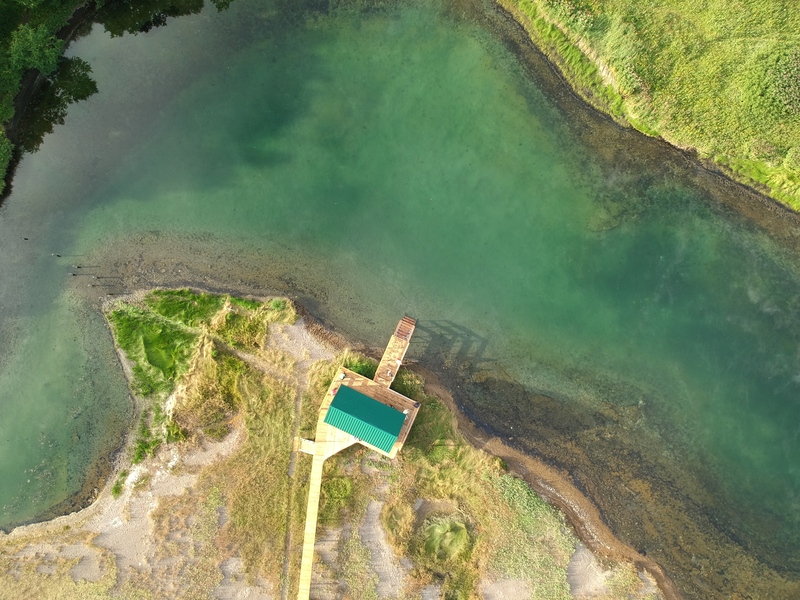 We exit the river at the “Japanese Bridge”, a gas pipeline that crosses the river at ca. 12.00. 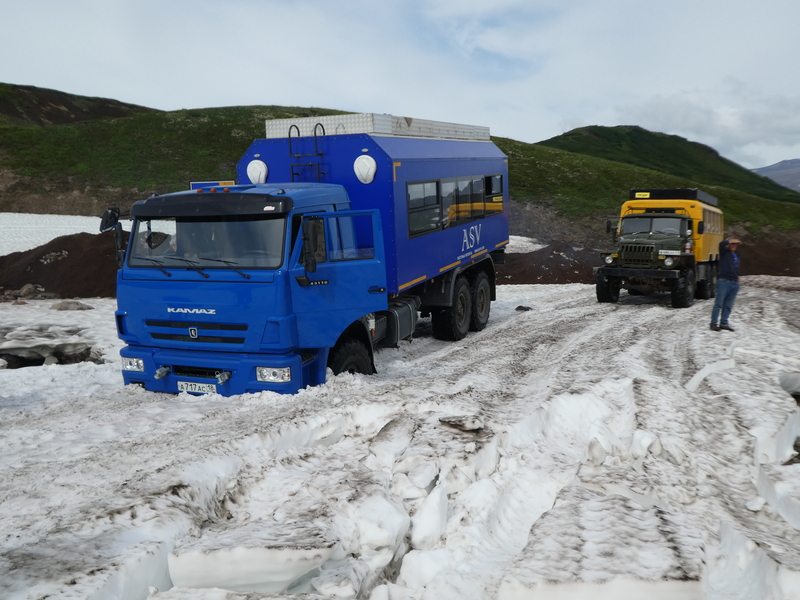 Unload the boats, have lunch, load the truck and we are on our way back to Petropavlovsk. First we drive on a small forest road, but later the roads become bigger. 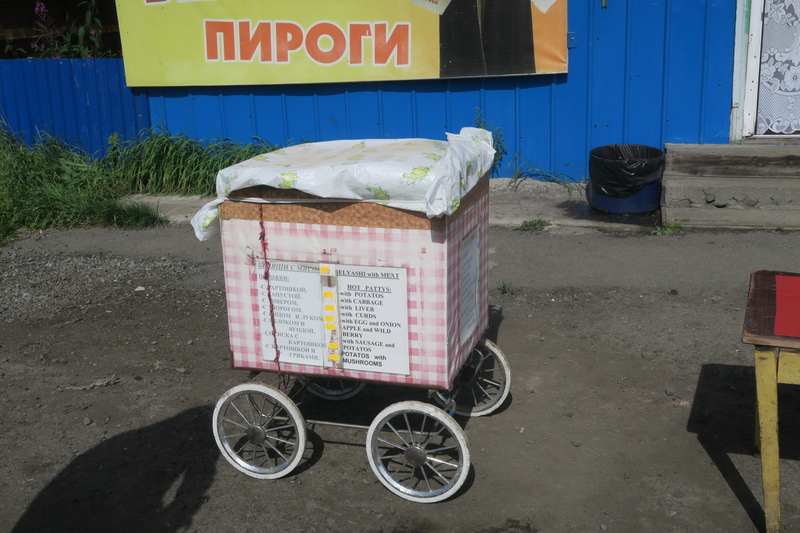 We stop at a rest stop close to Malki and eat pirogi “out of the baby carriage”, not literally as the lady is selling them inside her store. 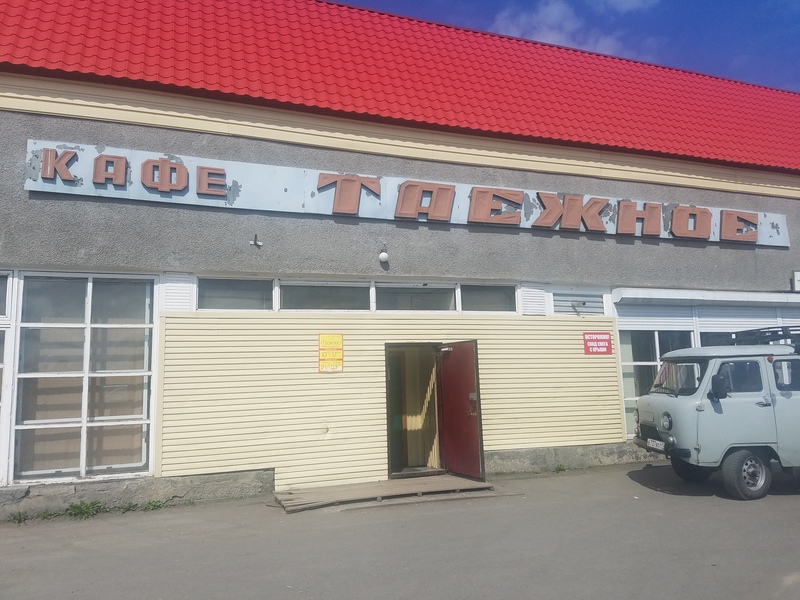 From the rest stop, its all tarmac until Petropavlovsk. 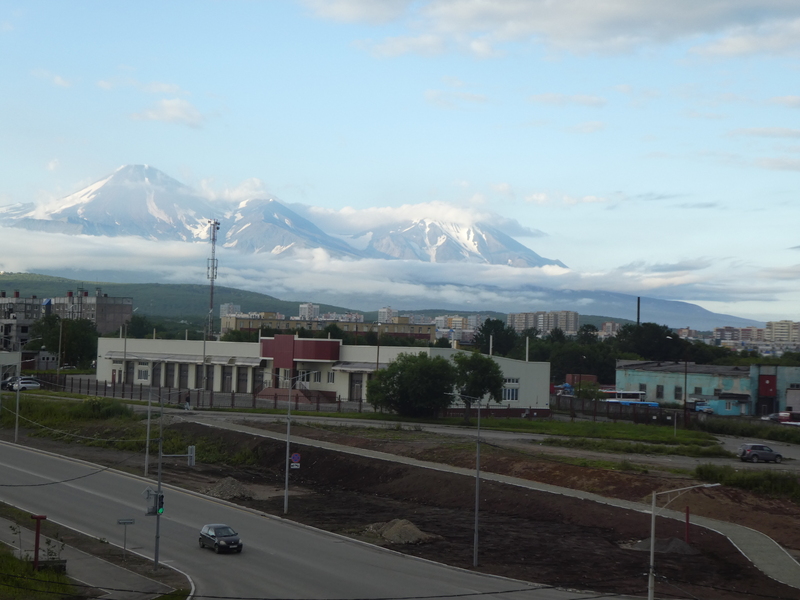 At about 17.30, we reach the hotel Petropavlovsk. Evening is slow with dinner, talks and repacking the bags for the next day. 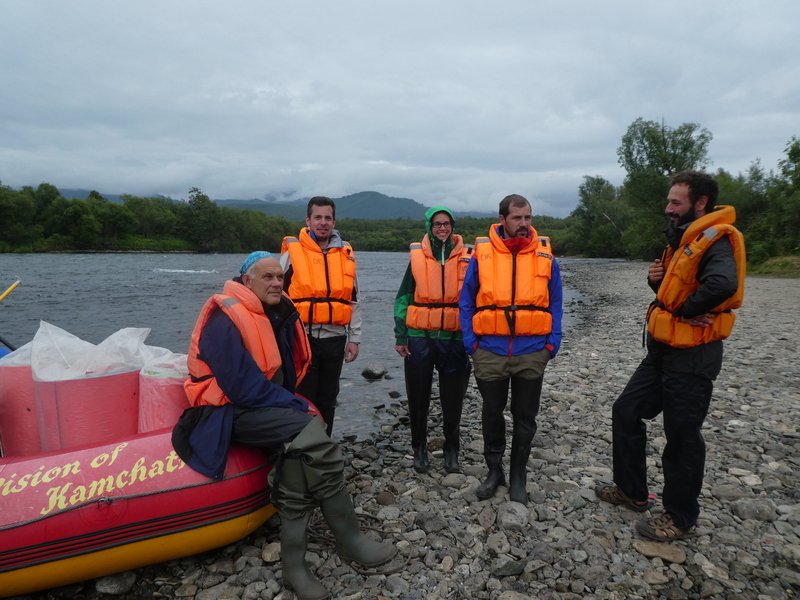 We get up early (6.15) to get on the boat in Avacha Bay. We divide the group to 2 boats. Ours is a nice catamaran. The helmsman arrives a bit late and at about 8.30 we leave the harbor. The harbor has a run down sowjet charm. 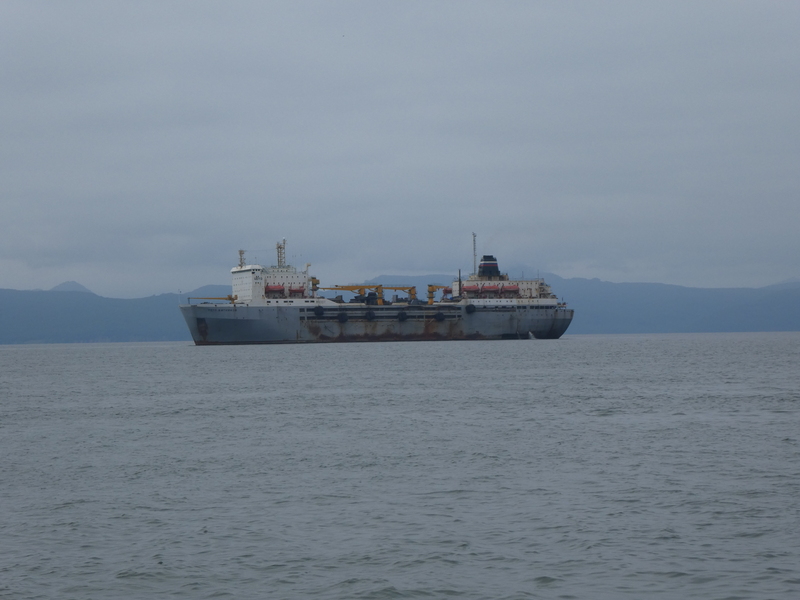 Ships look so rusty like they are decomissioned but they are not. 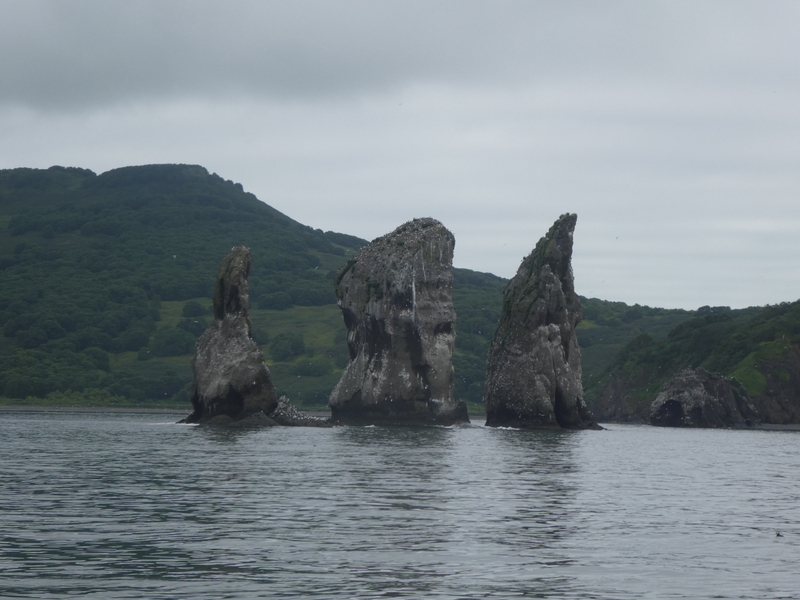 We first sail to the Three Brothers, a rock formation at the entrance of the bay. On the way, we see many Puffins. They have trouble taking off and frequently flap helplessly in the water. From the Three Brothers, we sail south along the coast. 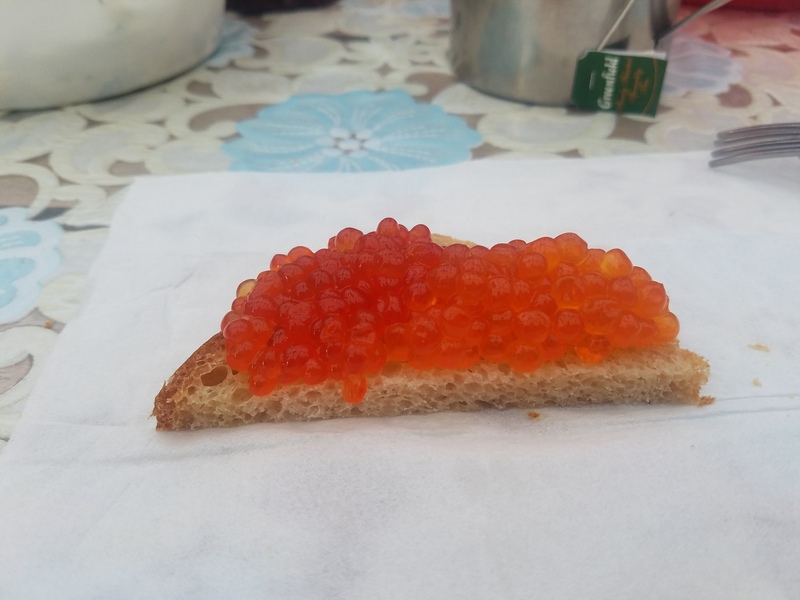 First, we have a breakfast snack with salmon and caviar. 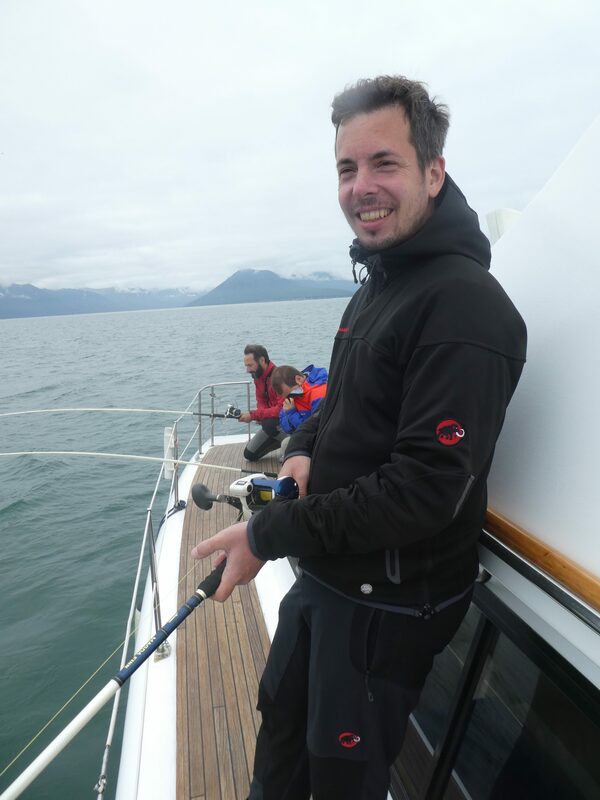 A bit later, we amake a (30min) stop for fishing. Easy fishing (Scholle) but due to the long line and heavy weight, we do not notice the bites. 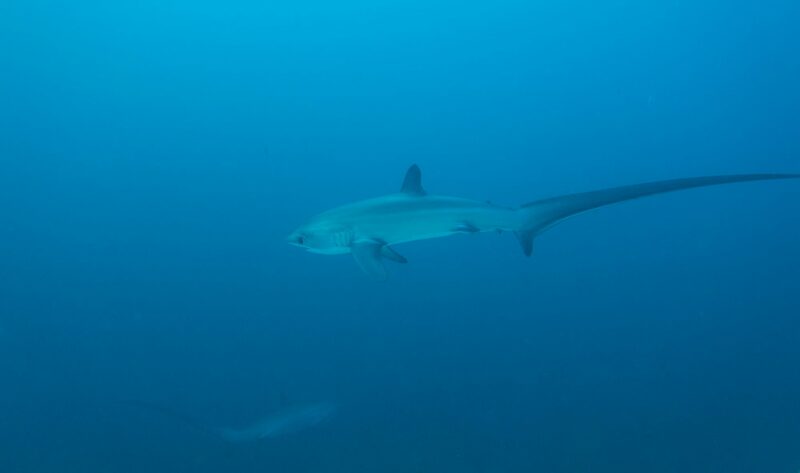 We wait disappointed but as we reel in to leave the place, we find we have a fish on the hook, each. 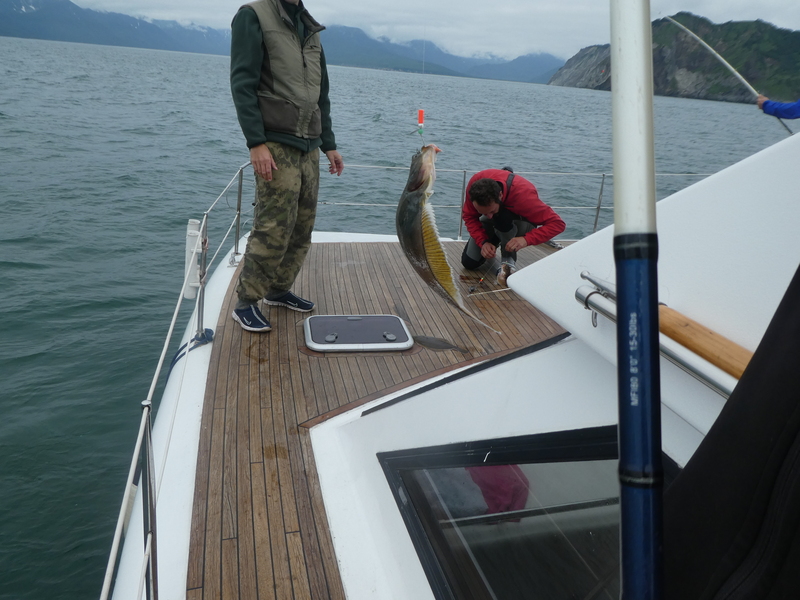 We sail on and eat the freshly caught fish as well as salmon soup. 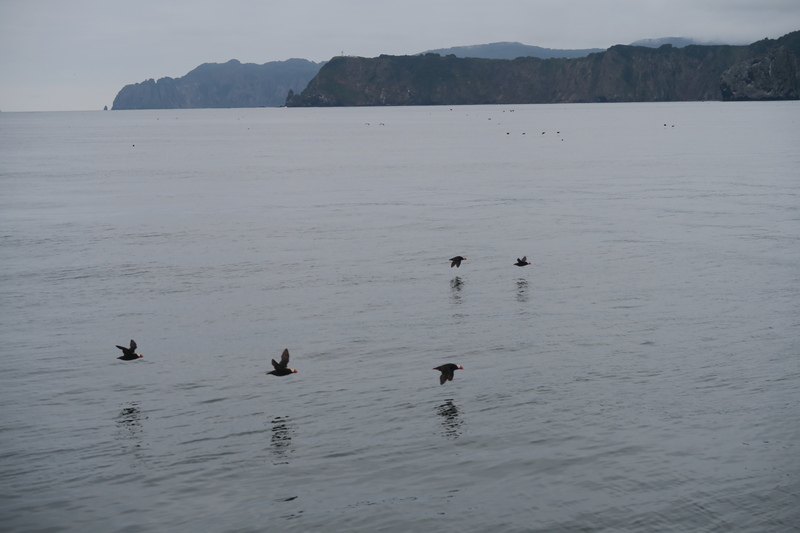 We anchor in a bay and take the dingi to ride through a cave and look at birds. 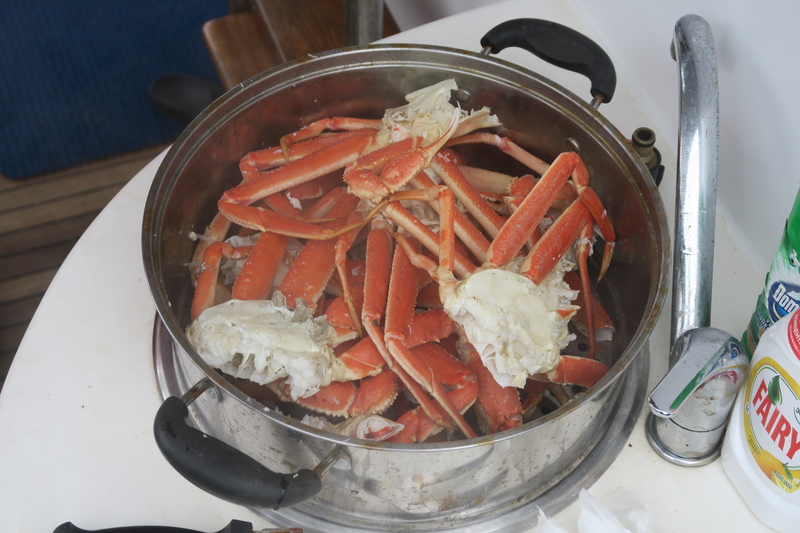 Back on the boat, we eat fresh Kamchatka Crab, caught in the morning. 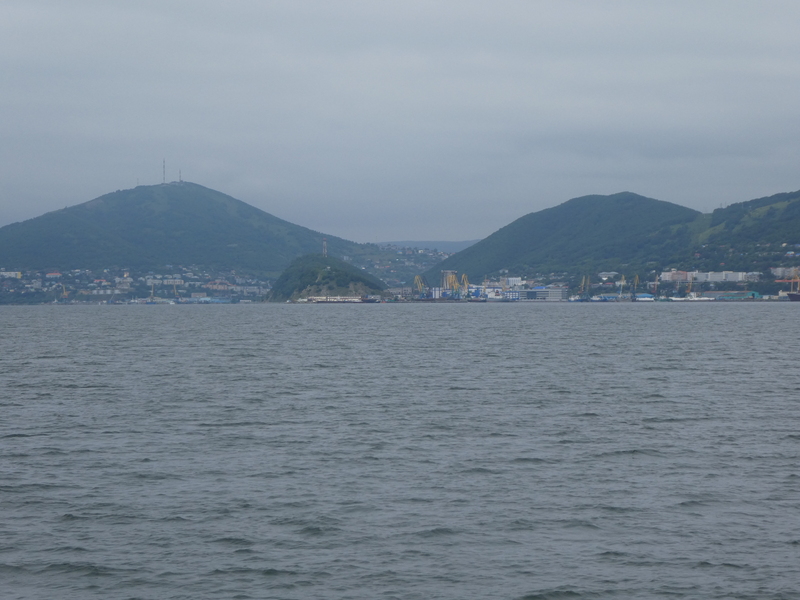 From there, we sail back to port, where Stephan and Sergej await us. 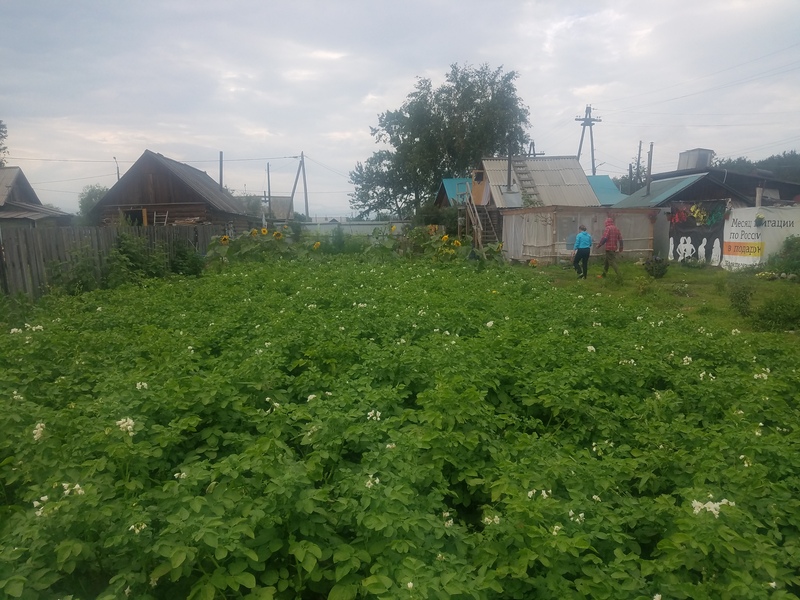 Its a 60km drive to our camp in the Mutnovski Area but it takes about 3h. We stop at the Silver Creek Spring to refresh ourselves. At ca. 18.30, we reach the camp. 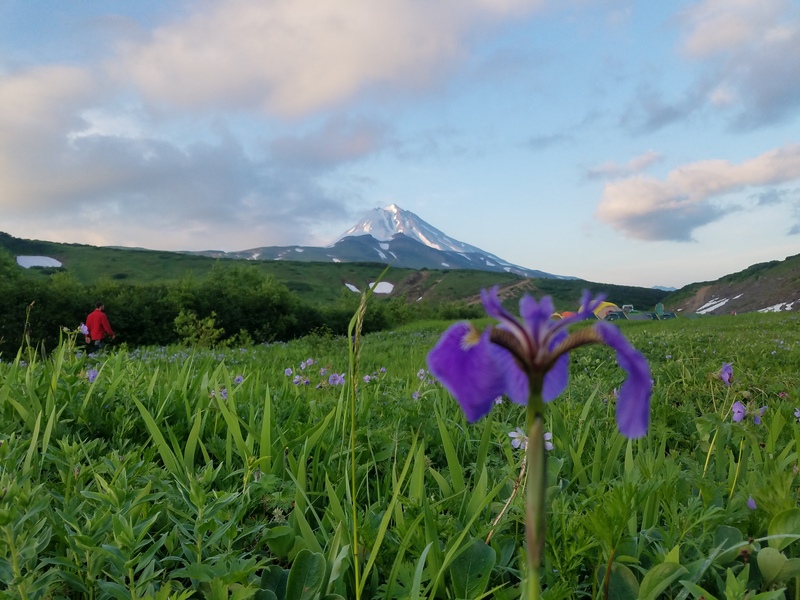 The camp is in a beautiful meadow at the foot of Vilyuchik volcano. We hike around camp a bit and after dinner and talks go to bed. Breakfast at 7.00. Too late for a summit day and this group size. We are in the truck by 9 and happily bump along the road to Mutnowski Power Station. Our guides plan to drive closer to Mutnowski to shorten the hike. As we crawl with 6km/h across the caldera, we wonder if that really helps. All of a sudden, the truck goes to its knees and stops with a thud. The front axel has broken into the snow. While the driver and a second truck that has been driving with us free the truck, we start to hike. 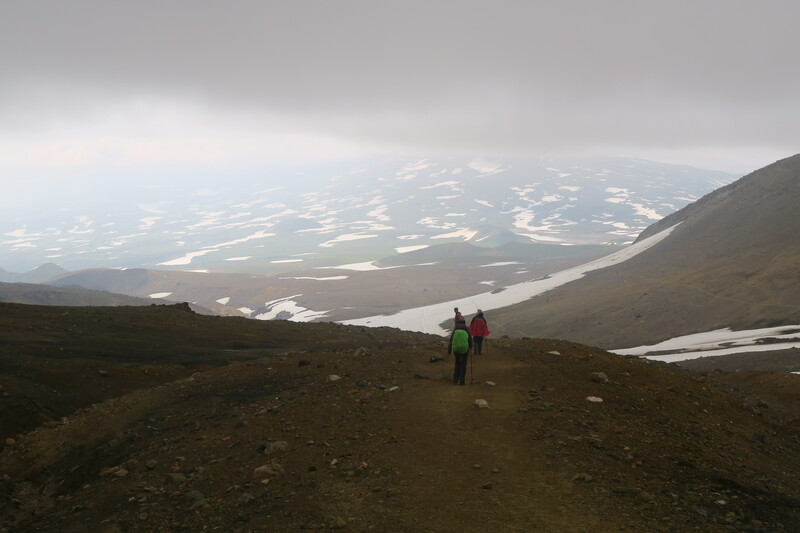 We walk along the base of the Mutnowski Group through an amazing volcanic landscape. The weather is sunny and warm, and sweat runs into our eyes. About 1.5h later, we reach the upper parking lot, at the same time as our now empty truck. Its late, 13.00 and Sergej urges us to move on. Three weak links are left behind as we set out on the snow fields of Mutnowski. As we turn left into the ascent valley, high stone and ice walls rise on both sides. A fresh landslide complicates the path. 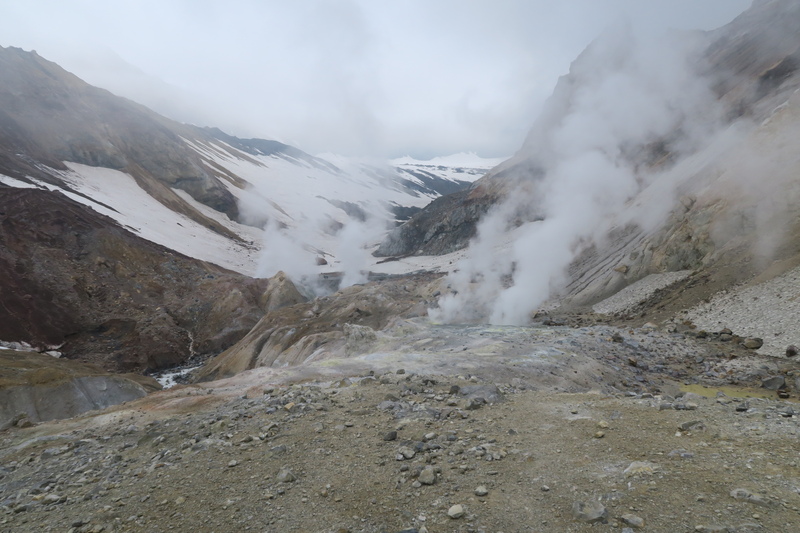 A steep climb over a muddy trail opens the view on a glacier and giant steam vents. The range of colors is breathtaking. “And?” Stephan asks. “Super cool”, I reply. “No! Its fabulous” he rightly corrects. 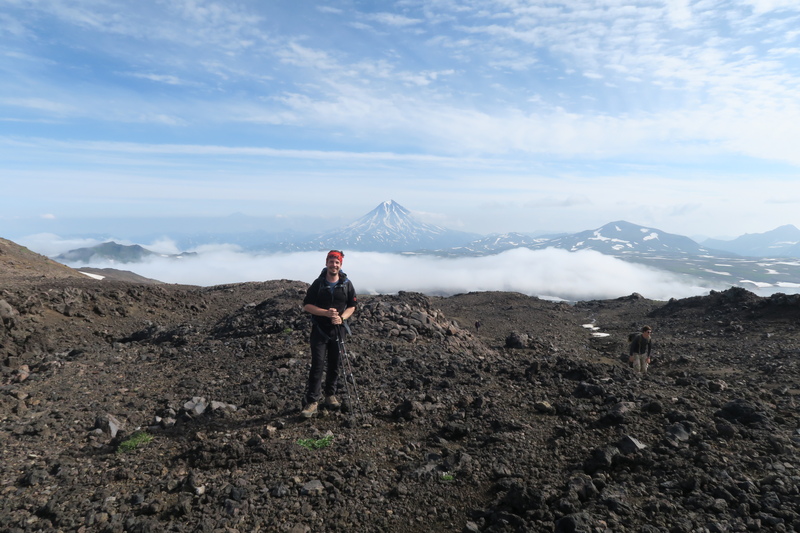 A little way further we reach a plateau overlooking a valley of steaming vents (fumeroles). 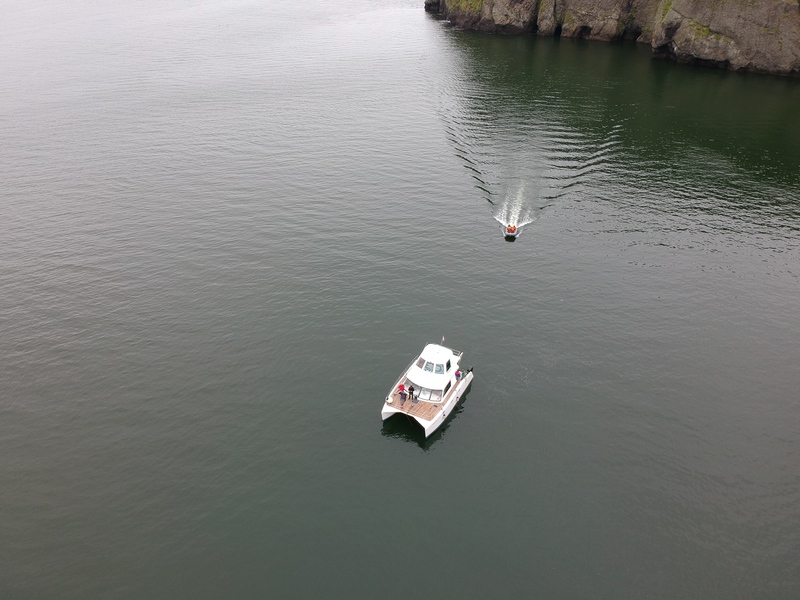 I fly the drone, but am Happy to have it back as the GPS does not work reliably. 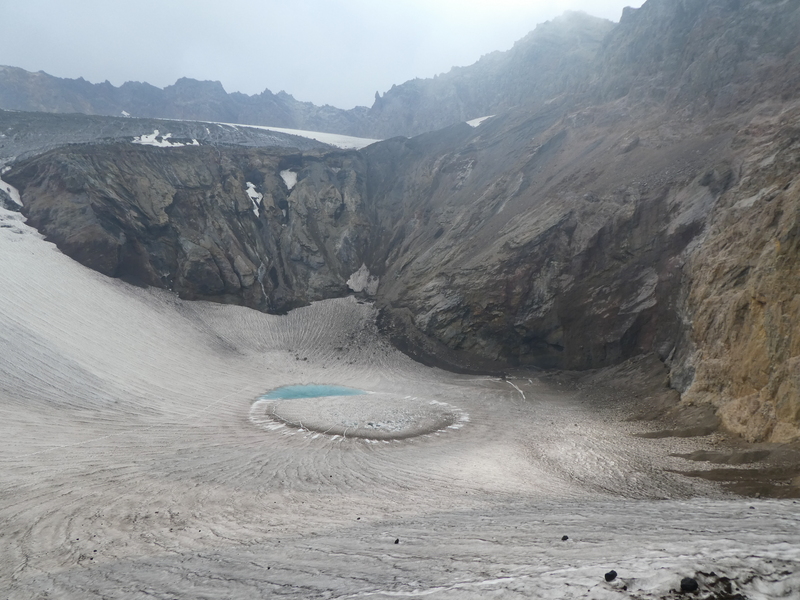 Beyond the valley, we ascent to the first crater, at whose bottom a bright blue lake shines under the snow. Up a short ropeway opens the view into the second crater. Simply amazing. Rain starts, as we descent but stops as we leave the valley for the parking lot. We hop on the truck and happily bump back to camp. We reach at ca. 21.00. Very tired we sit down for dinner, but energized talk until midnight. This is maybe the most organized morning of the tour. 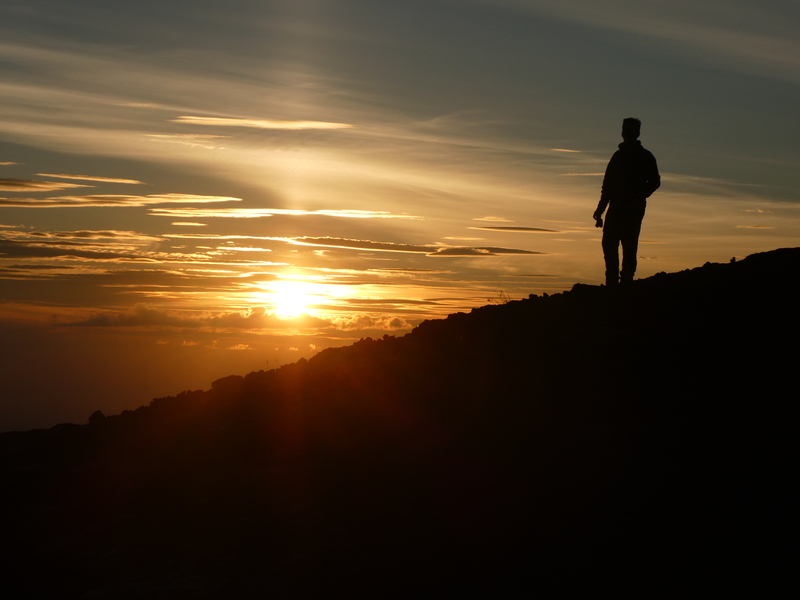 Breakfast at 8.00, leave at 9.00, start hiking at 10.00. We are a smaller group, only, and make good time. The hike up is steep. 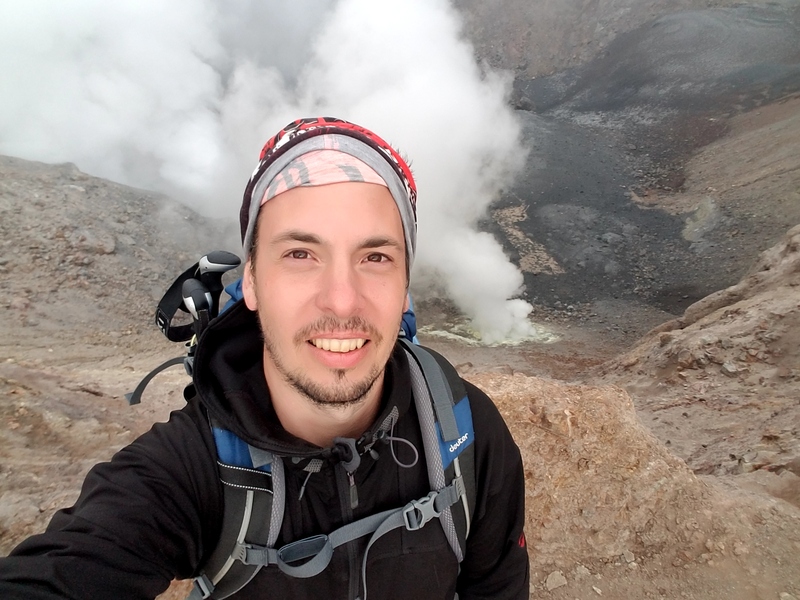 We climb 500m/h and reach the crater at 11.30. The view is breathtaking. 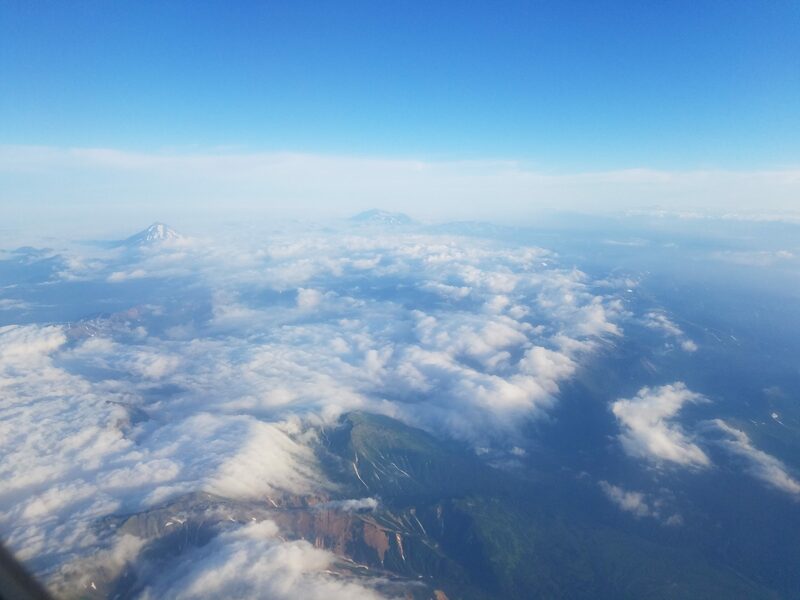 We can see Mutnowski, Vxxcc, and other volcanos. We are among the few lucky ones that see the full panorama in bright sunshine with few clouds. Only the group before us had to turn around in heavy rain and storm. The crater itself is stunning. 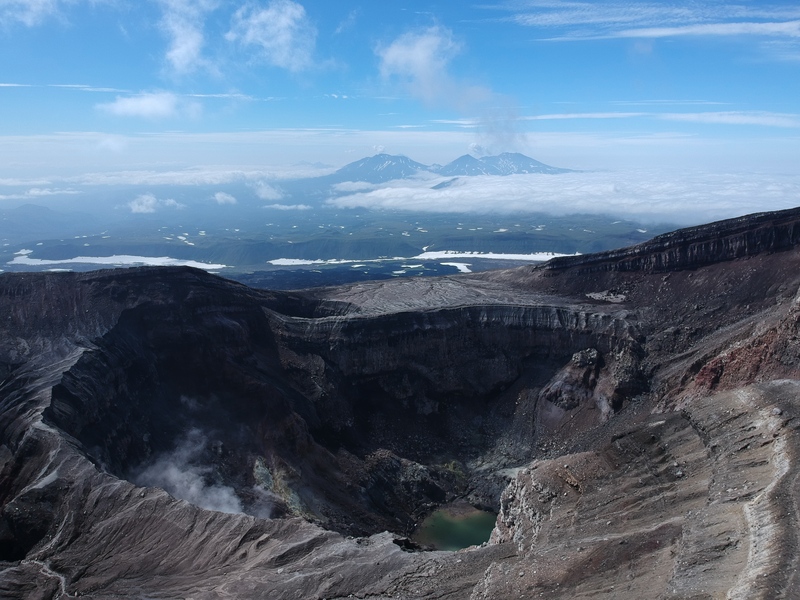 There are two large craters, one with a large lake and one with steam vents. 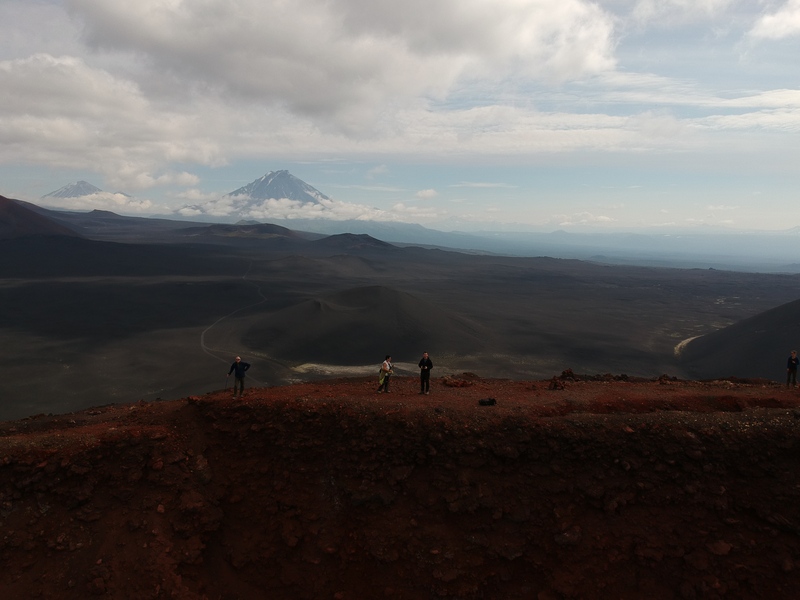 We walk around the steep and narrow edge of the craters and take a break at the far side. Only a short while later, the first clouds move in. We were truly lucky. We race back down to the parking lot. 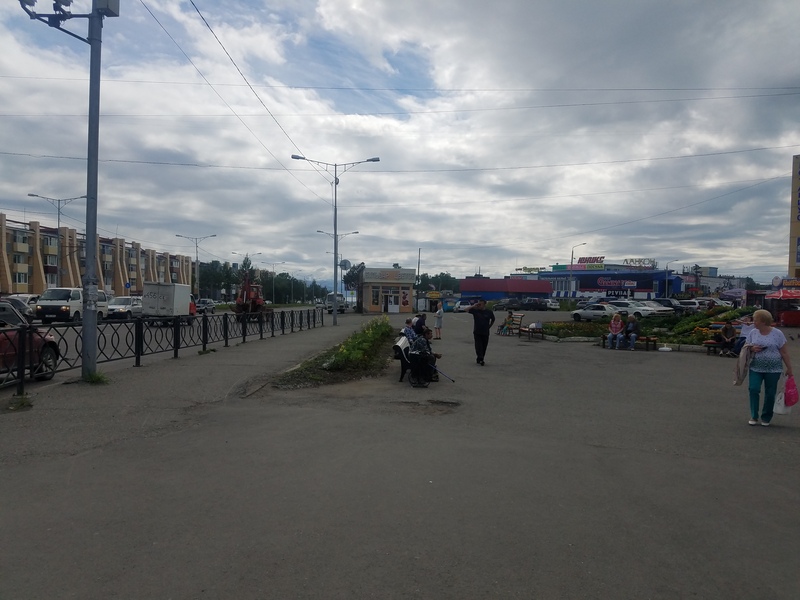 Past streams of Kamchatkans, who are climbing Gorely on this beautiful day. Happy, we drive back to camp to pack, then we are on our way to Paratunka. Although the hotel has a hot spring, we are too tired and decide to go to bed, after dinner. Its the day of big and small goodbyes. The first group leaves after breakfast. We leave with the rest at 11.30. 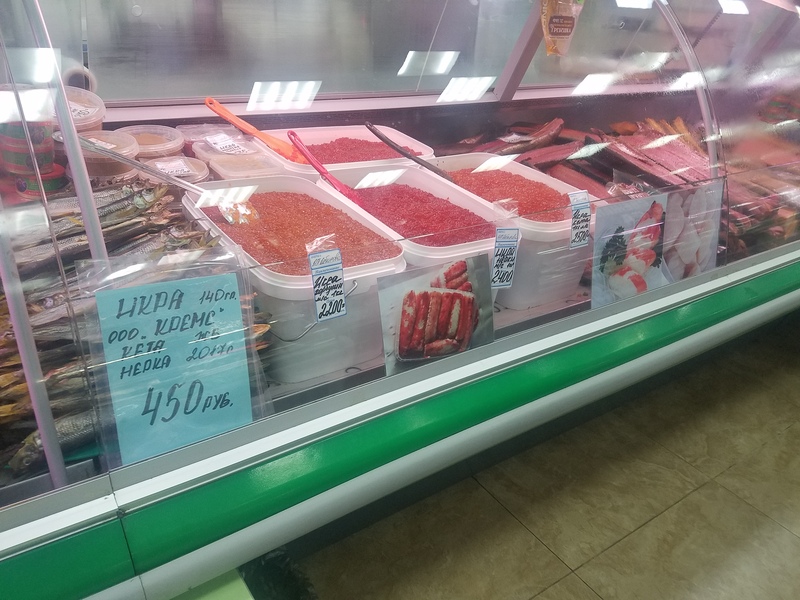 First, we visit the fish market to buy tons of salmon caviar (actually 2kg) at only 30EUR per kilo. Second, we stop by a souvenir shop. Third, we go to town. We get of at the Geyser Hotel and walk around town for three hours, including pizza lunch. At 16.30 we drive to the airport. The airplane is slightly delayed and there are no announcement screens in the airport. “Be patient, my friends”. 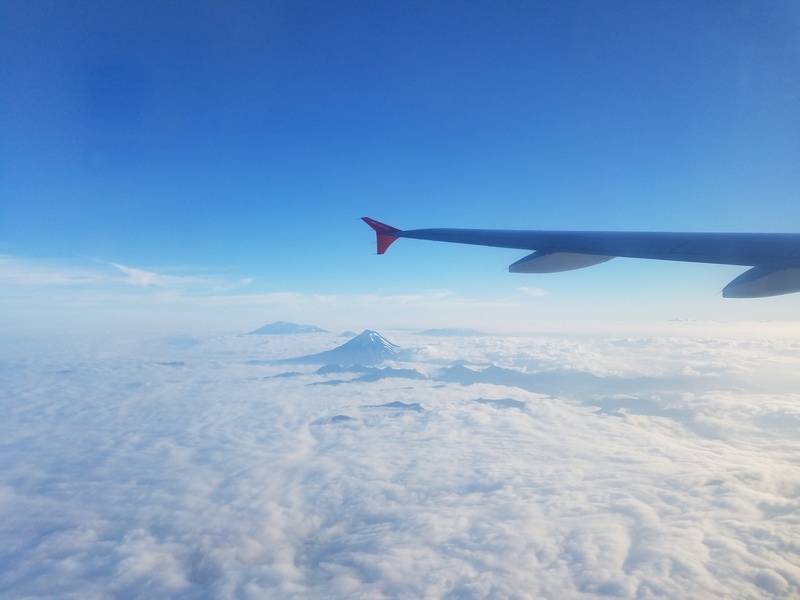 The plane takes off and the pilot rewards us with an incredible view over the Mutnowski Vulcanos sticking out of the clouds. We say our final goodbye to this incredible place. The rest of the trip is quite smooth. 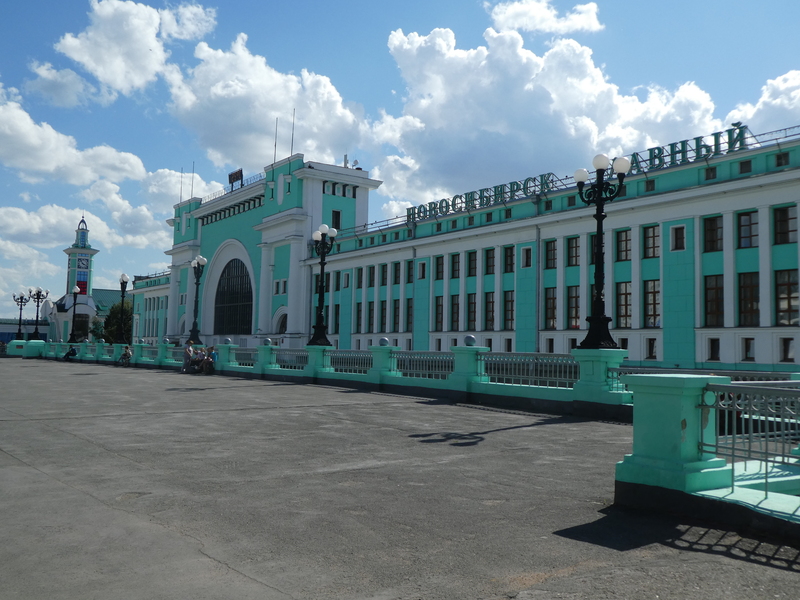 After 3h, we reach Vladivostok and, after a long wait, have another three hours to Shanghai. We reach home at 3am CEST; tired but happy.